Iowa Class Battleship; Displacement 11,410 Tons, Dimensions, 362' 5" (oa) x 72' 3" x 26' 10" (Max), Armament 4 x 12"/35 8 x 8"/35, 6 x 4"/40 4 x 14"tt, Armor, 14" Belt, 17" Turrets, 3" Decks, 10 " Conning Tower. Machinery, 11,000 IHP; 2 vertical, triple expansion engines, 2 screws, Speed, 16 Knots, Crew 486. Operational and Building Data: Laid down by Cramp, Philadelphia, on August 5 1893; Launched March 28, 1896, Commissioned June 16, 1897, Decommissioned June 30 1903, Recommissioned December 23, 1903, Decommissioned July 23, 1908, Recommissioned May 2, 1910, Decommissioned May 23, 1914, Recommissioned April 23, 1917, Decommissioned March 31, 1919, Stricken March 27, 1923. Reclassified IX-6, July 21, 1921 and used as Radio Controlled Target Ship. 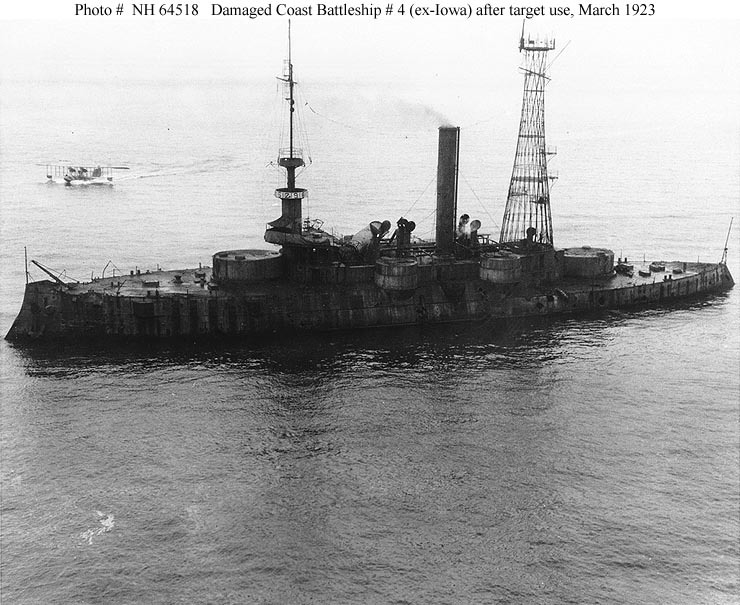 Fate: Sunk as target by Mississippi (BB-41), in the Gulf of Panama, March 23 1923. 57k Cross section of the Iowa (BB-4) taken from a plan dated 1893. Photo and text courtesy of U.S. Battleships: An Illustrated Design History by Norman Friedman. (The keel blocks have been cut and the sliding ways are carrying the vessel to the ocean.) Image and text provided by Library of Virginia; Richmond, VA.
Photo & text by The Times. (Richmond, Va.) 1890-1903, 18 March 1896, Image 6, via chroniclingamerica.loc.gov. 3.49k The Iowa (BB-4), Greatest of America's Battle-Ships, Successfully Launched at the Cramps Shipyards at Philadelphia. Image and text provided by University of California, Riverside. Photo from The San Francisco Call. (San Francisco [Calif.]) 1895-1913, 29 March 1896, via chroniclingamerica.loc.gov. 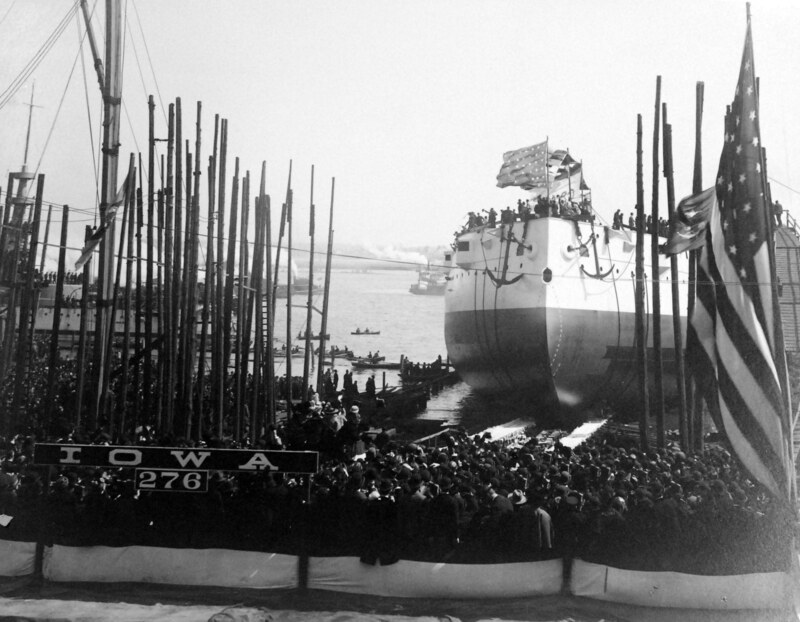 485k The Iowa (BB-4) slides down the launching ways at Cramp Shipbuilding in Philadelphia, 28 March 1896. With temporary anchors ready for letting go if necessary to check her momentum, the Iowa enters her element for the next 27 years. Library of Congress photo # LC-USZ62-59526, courtesy of Mike Green. 3.04k A glass photo slide showing the Iowa (BB-4) sliding down the launching ways at Cramp Shipbuilding in Philadelphia, 28 March 1896. Photo from pacificbattleship.com courtesy of Dave Way, Curator, Battleship Iowa BB 61, Pacific Battleship Center. 359k Iowa (BB-4) sliding down the launching ways at Cramp Shipbuilding in Philadelphia, 28 March 1896. I believe the Massachusetts (BB-2) is immediately off the bow of the Iowa. She would be commissioned on 10 June. Photograph PR-3-Box 83-4 by William H. Rau, courtesy of the Library of Congress & National Museum of the U.S. Navy via flickr.com. 506k Iowa (BB-4) at rest at Cramp Shipbuilding in Philadelphia, 28 March 1896. Photograph PR-3-Box 83-2 by William H. Rau, courtesy of the Library of Congress & National Museum of the U.S. Navy via flickr.com. 360k Running trials in 1897. She is flying the flag of her builder, William Cramp & Sons, of Philadelphia, PA. Photo by A. Loeffler. LOC LC-USZ62-60462. 619k THE SWIFT NEW BATTLESHIP IOWA (BB-4). On a recent trial trip the battleship Iowa, Uncle Sam's latest and strongest pet in the way of fighting machines, averaged 16.7 knots per hour, a knot and a quarter more than her contract calls for. She is a very formidable ship. Image and text provided by University of Hawaii at Manoa; Honolulu, HI & Library of Congress, Washington, DC. Photo & text by The Hawaiian Gazette. (Honolulu [Oahu, Hawaii]) 1865-1918, 02 February 1897, Image 5, & New-York Tribune (New York [N.Y.]) 1866-1924, 04 April 1897, Image 29, via chroniclingamerica.loc.gov. 3.41k THE LATEST ADDITION TO UNCLE SAM'S NAVY. 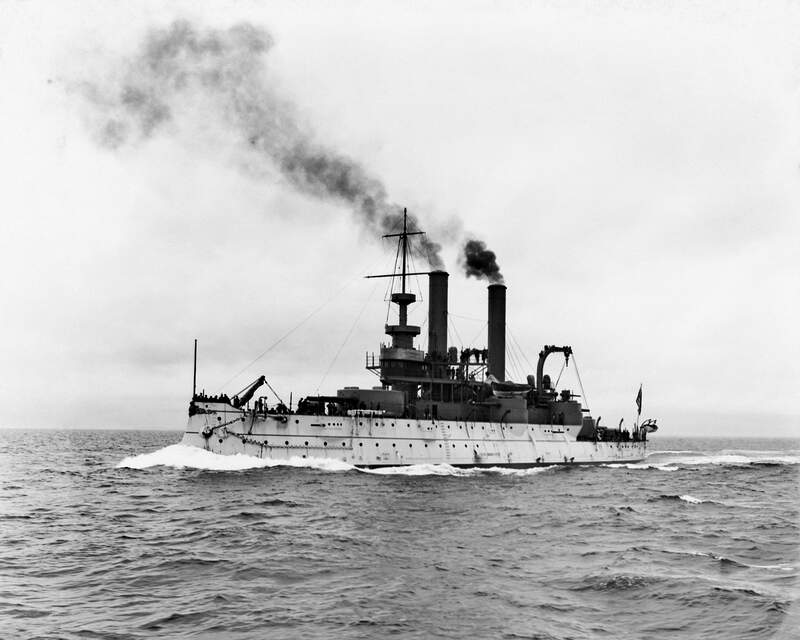 The Battle-ship Iowa (BB-4) at the Conclusion of Her Trial Trip, Just After Passing Cape Ann. 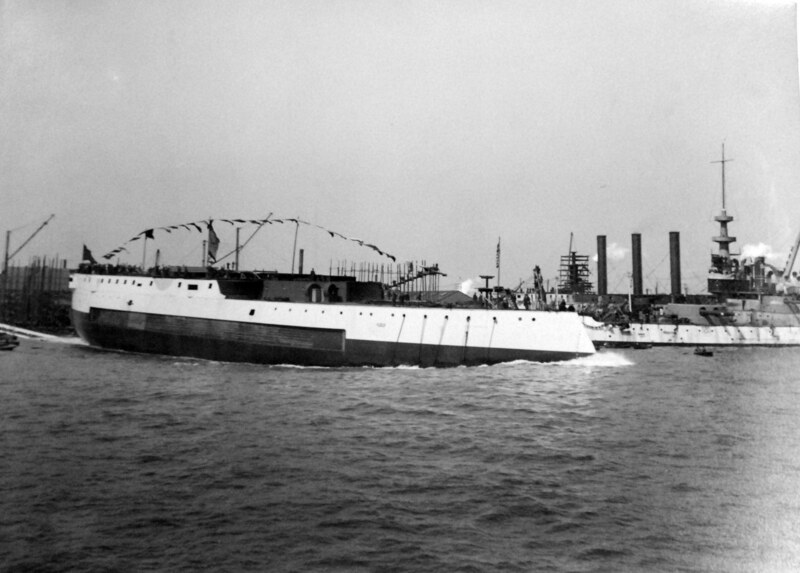 Fast Time Made by the Battle-Ship on Its Trial Trip. Image and text provided by University of California, Riverside. Photo from The San Francisco Call. (San Francisco [Calif.]) 1895-1913, 08 April 1897, Image 1, via chroniclingamerica.loc.gov. 79k Captain W.T. 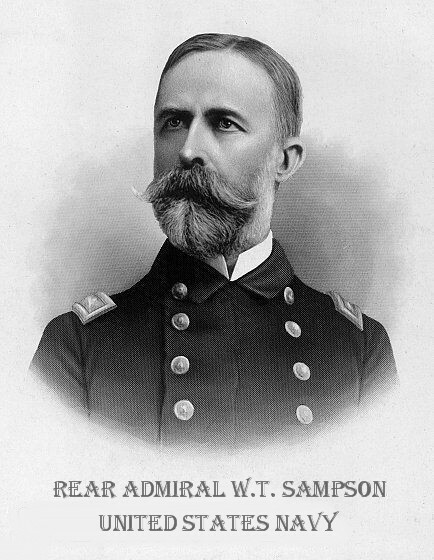 Sampson was in command of the Iowa (BB-4) during her commissioning: overall from 16.06.1897 to 17.01.1898. Photograph submitted by Bill Gonyo. 432k A line drawing of the Iowa (BB-4) as completed. 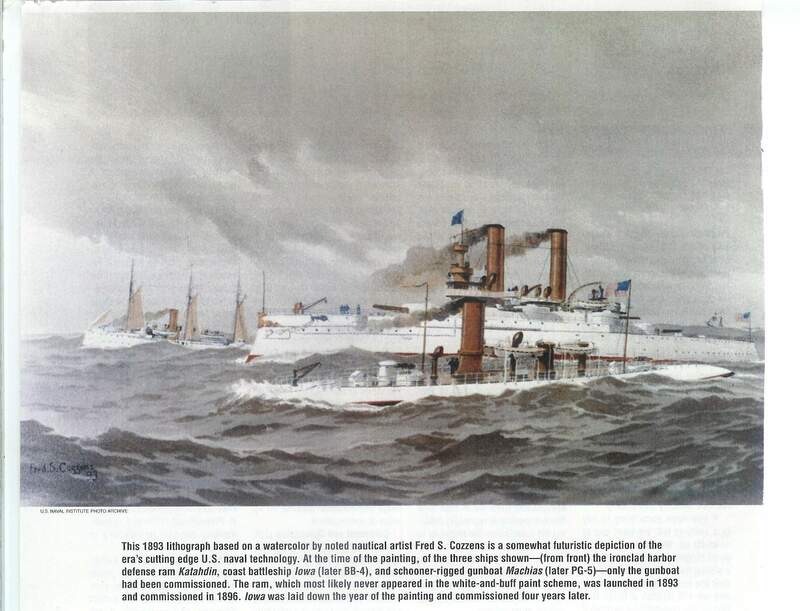 Photo courtesy of Transactions of the Society of Naval Architects and Marine Engineers, collection of Robb Jensen. 39k Drawing of the Outboard Profile of battleship Iowa (BB-4) corrected to 1910. 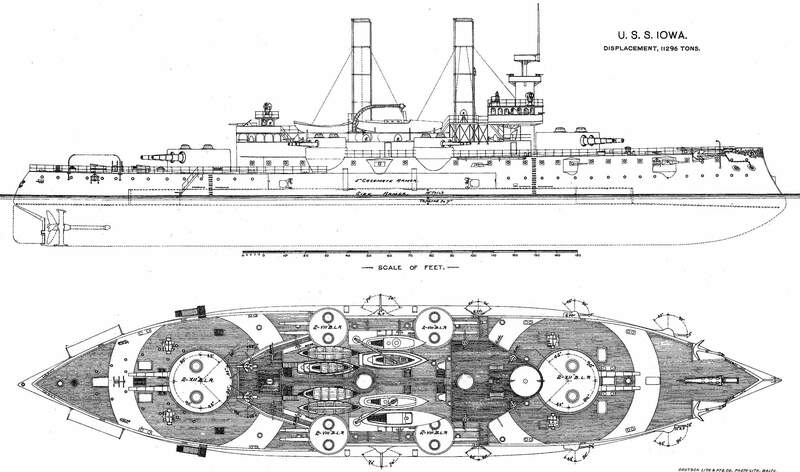 This is an 1897 drawing which has been altered over the years, as is Navy practice to keep up with changes in the ship. The after bridge is gone, replaced by a cage mast with a spotting top. The two-level chart-house and bridge combination has been replaced by a single open bridge. USN photo courtesy of USNI. 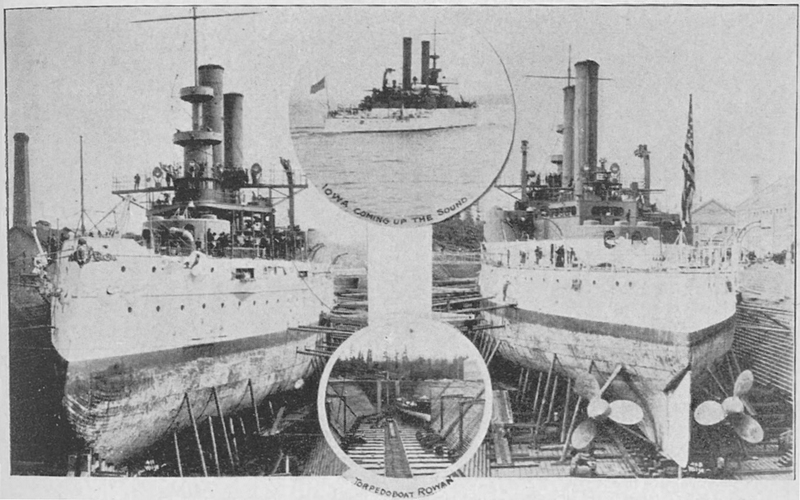 238k New York (CA-2), Newport (PG�12), Brooklyn (CA-3), Iowa (BB-4) in 1897 at the Brooklyn Navy Yard. Photo by William H. Rau submitted by Ron Reeves (of blessed memory). 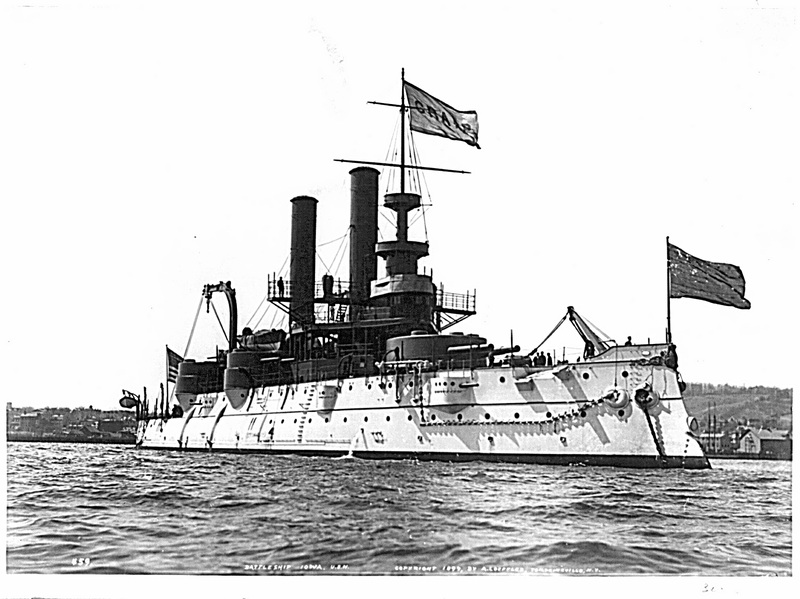 This is an original 1898 black and white halftone print of the largest ship in the American fleet during the Spanish American War, the Iowa (BB-4). A larger version, from Colliers History of the Spanish American War,, appears here. Insert photo courtesy of courtesy of Dan Wilmes. 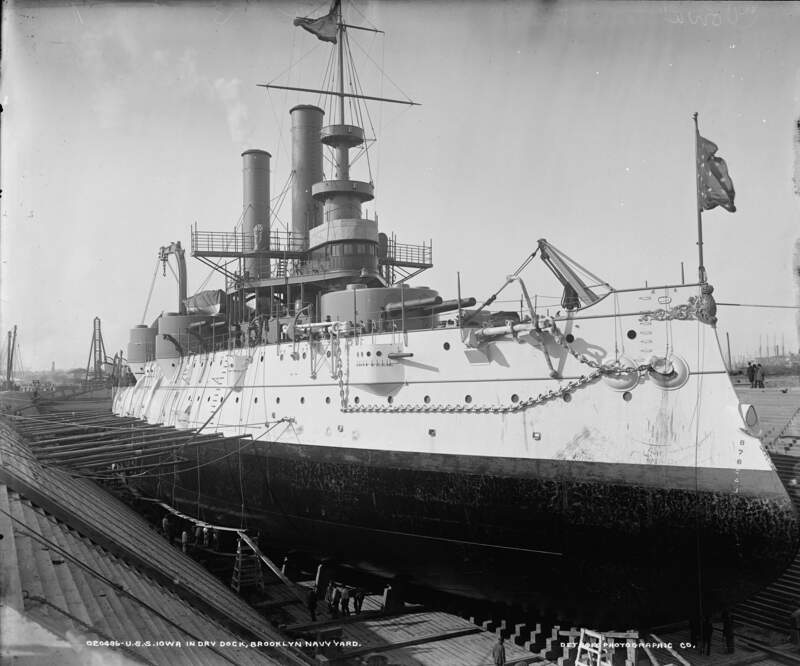 Photo by Enrique Mueller Jr.
1.16k Iowa (BB-4) in dry dock, Brooklyn Navy Yard, 1897-1901. Detroit Publishing Company Photo LC-DIG-det-4a14265 courtesy of loc.gov. 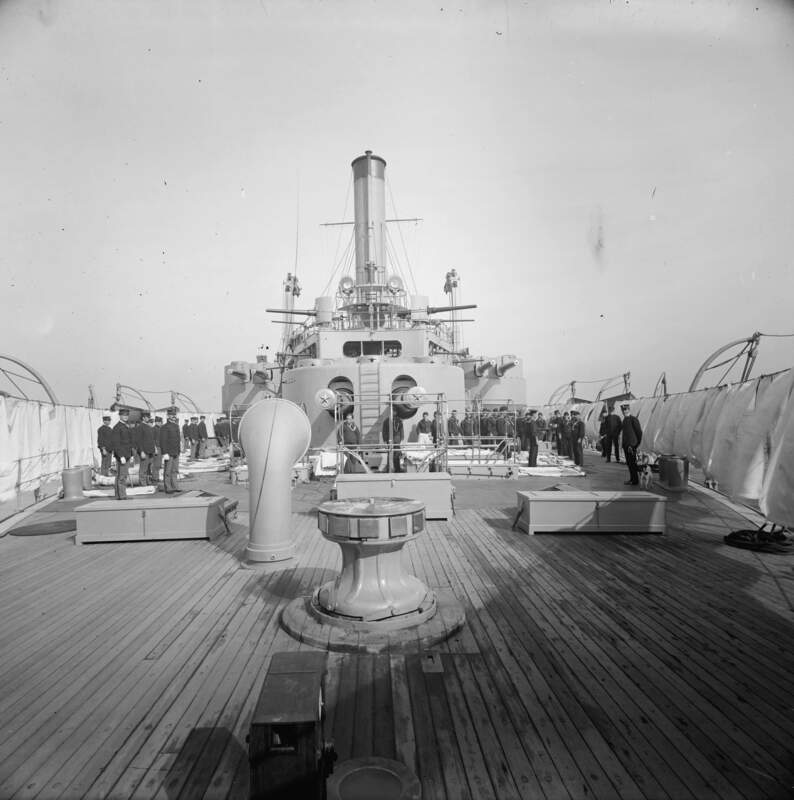 788k Stern view of the Iowa (BB-4) showing her aft 12-inch and 8-inch turrets sometime between 1897 and 1901. 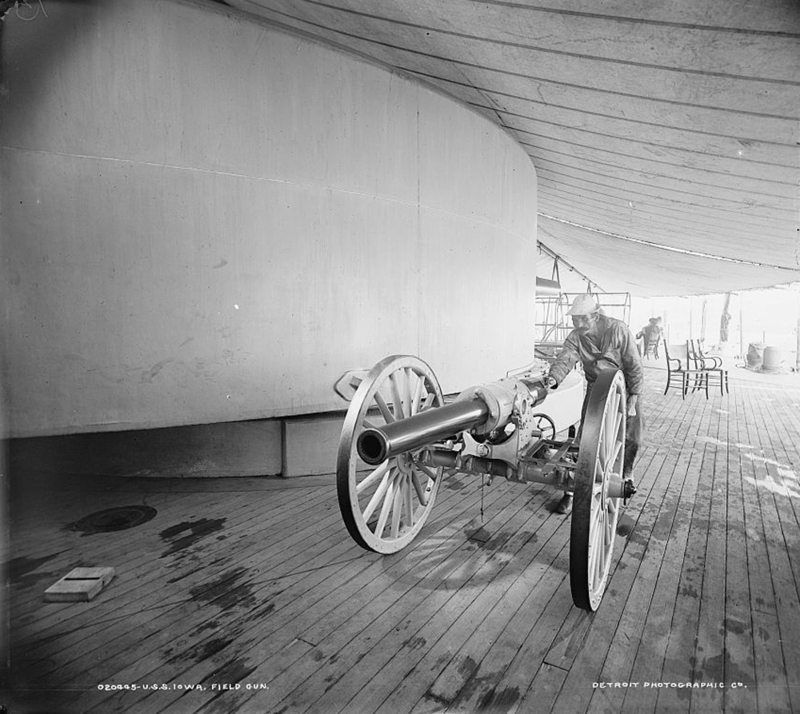 4-inch open mounts are located one deck above the 12-inch turret. Library of Congress # LC-D4-20438, courtesy of Mike Green. 696k THE NORTH ATLANTIC SQUADRON, NOW BLOCKADING CUBAN PORTS. Image and text provided by University of California, Riverside. NR READY TO FREE CUBA WHEN NECESSARY. 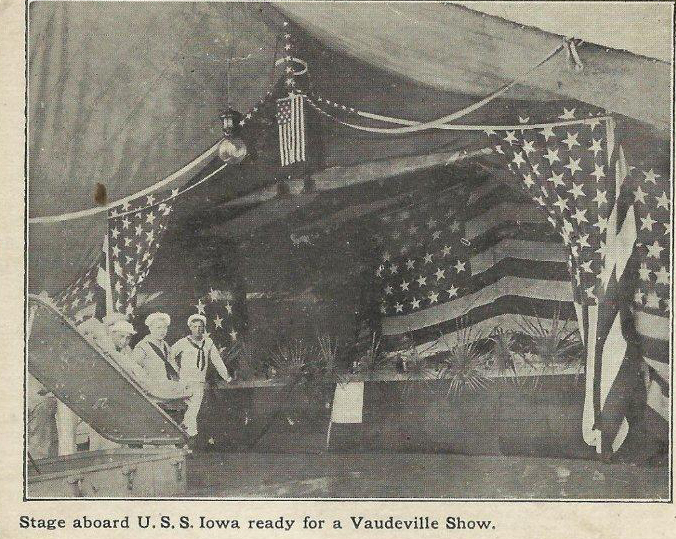 485k Vaudeville stage aboard the Iowa (BB-4). Photo courtesy of Tommy Trampp. Photo & text by The Salt Lake Herald. (Salt Lake City [Utah) 1870-1909, 03 April 1898, Image 24, via chroniclingamerica.loc.gov. Photo & text by the N.Y.Times via Bill Gonyo. NR THE BATTLESHIP IOWA (BB-4). What is regarded as one of the very finest vessels of the United States Navy is pictured above. Image and text provided by Library of Congress, Washington, DC. Photo & text by The National Tribune. (Washington, D.C.) 1877-1917, 12 May 1898, Image 8, via chroniclingamerica.loc.gov. 571k Iowa (BB-4) steaming at sea on a glass slide. Photo from pacificbattleship.com courtesy of Dave Way, Curator, Battleship Iowa BB 61, Pacific Battleship Center. 1. Monadnock (BM-3) . 2. Petrel. 3. Puritan (BM-1) . 4. Concord. 5. Wilmington. 6. Amphitrite (BM-2) . 7. Ajax. 8. Machias. 9. Cincinnati. 10. Marblehead. 1 1. Montgomery. 12. Minneapolis. 13. 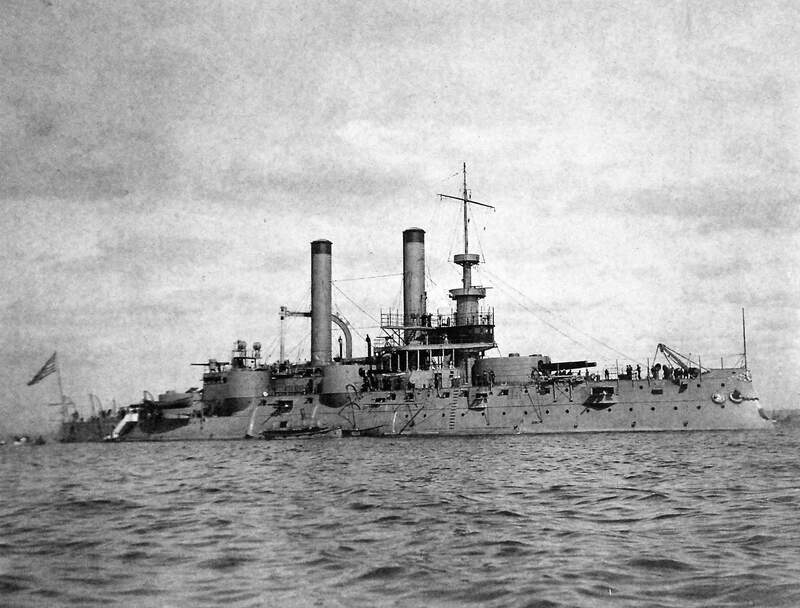 Kearsarge (BB-5). 14. Kentucky (BB-6). 15. Bancroft. 16. Dolphin. 17. Vesuvius. 18. Raleigh. 19. 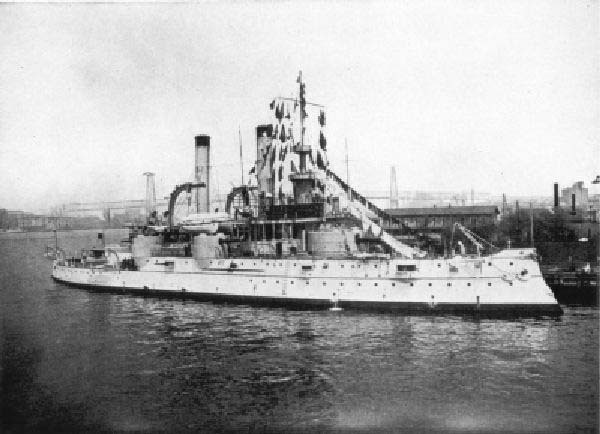 Indiana (BB-1). 20. 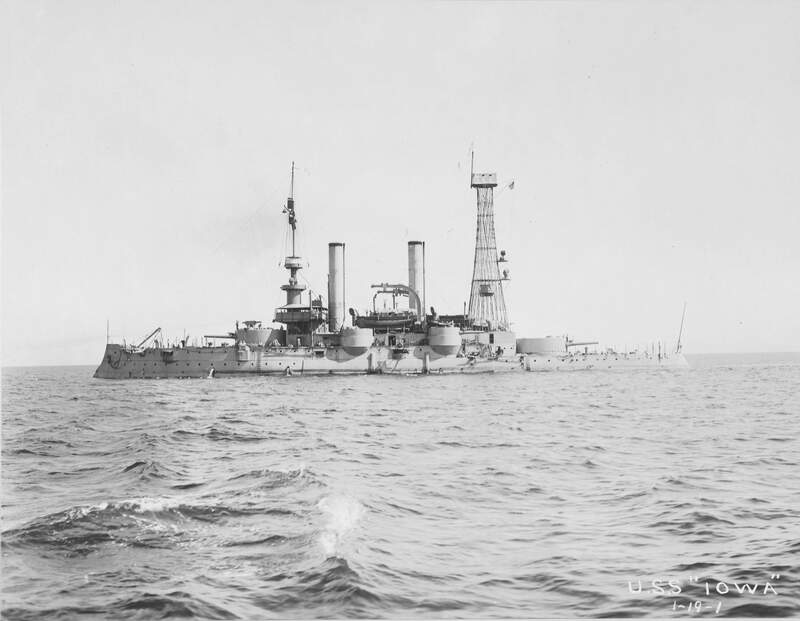 Iowa (BB-4). 21. Olympia. 22. Terror (M-4). 23. Catskill . 24. Miantonomah (BM-5). 25. Gustine. 26. Yorktown. 27. Texas. 28. Helena. 29. Massachusetts (BB-2). 30. Columbia. 31. New Orleans, 32. San Francisco. 33. Canonicus. 34. Camanche . 35. Monterey (BM-6). 36. Brooklyn. 37. Detroit 38. Atlanta. 39. Alabama (BB-8). 40. Albany. 41. Baltimore. 42. Chicago. 43. Newark, 44. Boston. 45. Charleston. 46. Oregon (BB-3). 47. New York. 48. Manhattan. 49. Philadelphia. 50. Lehigh. And Torpedo Boats. Drawn by "W. A. Verhas. Image and text provided by University of Tennessee. 748k ONE OF THE BIG GUNS ON THE BATTLESHIP IOWA (BB-4). Image and text provided by University of North Texas; Denton, TX. Photo & text by The Houston Daily Post. (Houston, Tex.) 1886-1903, 03 June 1898, Mailable Edition, Image 5, via chroniclingamerica.loc.gov. 454k Iowa (BB-4), starboard view. Photographed by K. Loeffler, 1898. Photo # Lot-3305-20 courtesy of National Museum of the U.S. Navy via flickr.com. 622k THE IOWA (BB-4) AND VIZCAYA COMPARED. Image and text provided by Central Michigan University, Clark Historical Library. Photo & text by The Copper Country Evening News. (Calumet, Mich.) 18? ?-1907, 14 June 1898, Image 4, via chroniclingamerica.loc.gov. Photo from The Herald. (Los Angeles [Calif.]) 1893-1900, 24 June 1898, Image 1, via chroniclingamerica.loc.gov. 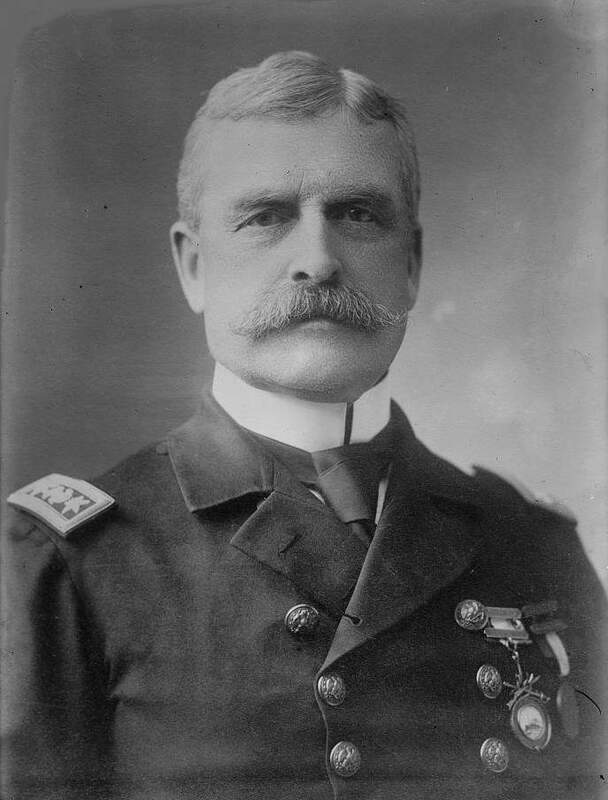 70k Captain Robley D. Evans, USN, during the Spanish-American War he was given command of the battleship Iowa (BB-4), and as her CO, he performed splendidly during the 3 July 1898 Battle of Santiago. Halftone reproduction of a photograph taken circa 1898, when he was Commanding Officer of Iowa. U.S. Naval Historical Center Photograph # NH 72727. Copied from "Harper's Weekly", Volume 42. Photo submitted by Bill Gonyo. Insert photo by Edward H. Hart, Detroit Publishing Company Photo by Edward H. Hart, # 4a14284v from lcweb2.loc.gov. 1.23k Battle of Santiago, 3 July 1898. Watching the battle from the deck of Iowa (BB-4). 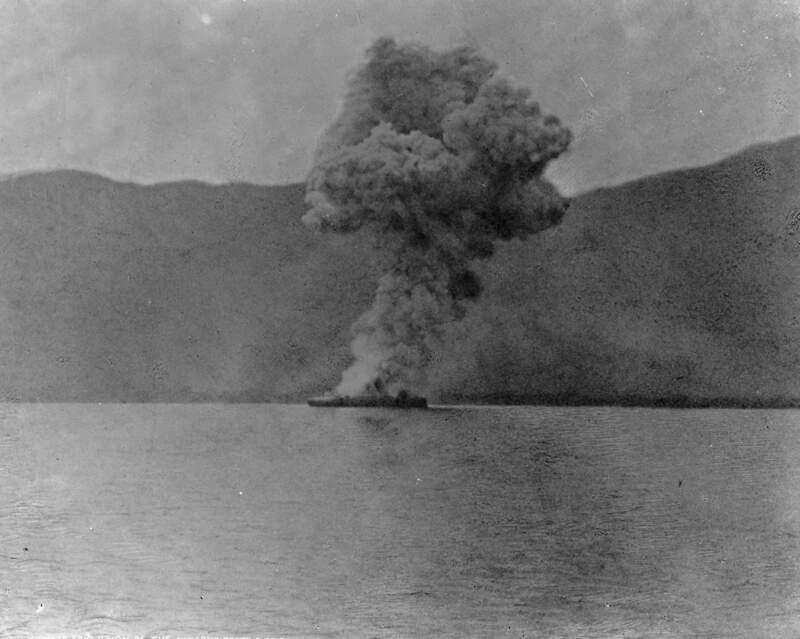 Note the volume of dense gun smoke around the ship in left center.Copied from the Journal of Naval Cadet Cyrus R. Miller. U.S. Naval Historical Center Photograph # NH 1132 & Navy Medicine # 09-7909-4 from flickr.com. 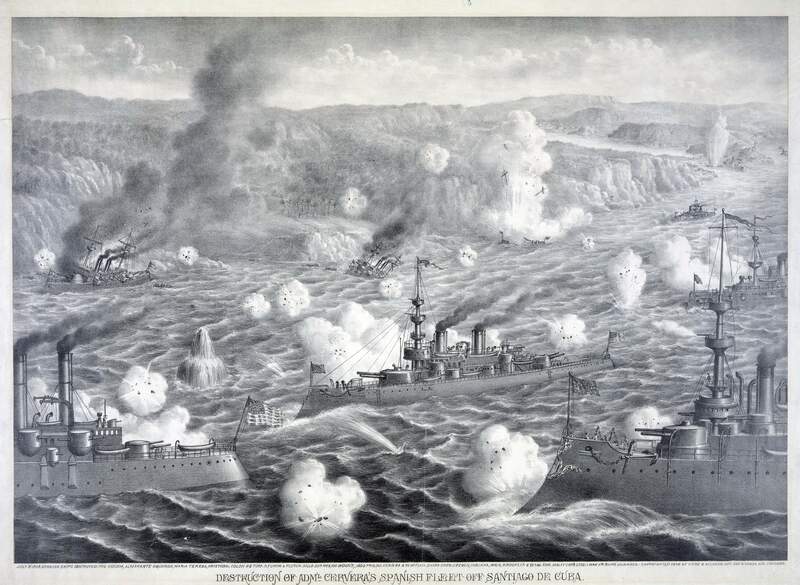 NR THE BATTLE OF SANTIAGO DE CUBA, 3 JULY 1898. A PAINTING OF THE ENGAGEMENT PLACED IN THE OFFICE OF THE CHIEF CONSTRUCTOR OF THE NAVY Image and text provided by Library of Congress, Washington, DC. Photo from New-York Tribune. (New York [N.Y.]) 1866-1924, 17 February 1901, Image 28, via chroniclingamerica.loc.gov. NR DURING THE DESTRUCTION OF CERVERA'S FLEET. FORWARD TURRET OF THE IOWA (BB-4) IN ACTION, From HARPER'S WEEKLY. Drawn by H. Reuterdahl. Image and text provided by Kansas State Historical Society; Topeka, KS. Photo & text by The Topeka State Journal. (Topeka, Kan.) 1892-1980, 25 July 1898, THIRD EDITION, Image 2, via chroniclingamerica.loc.gov. 491k IT WAS A GLORIOUS VICTORY ! 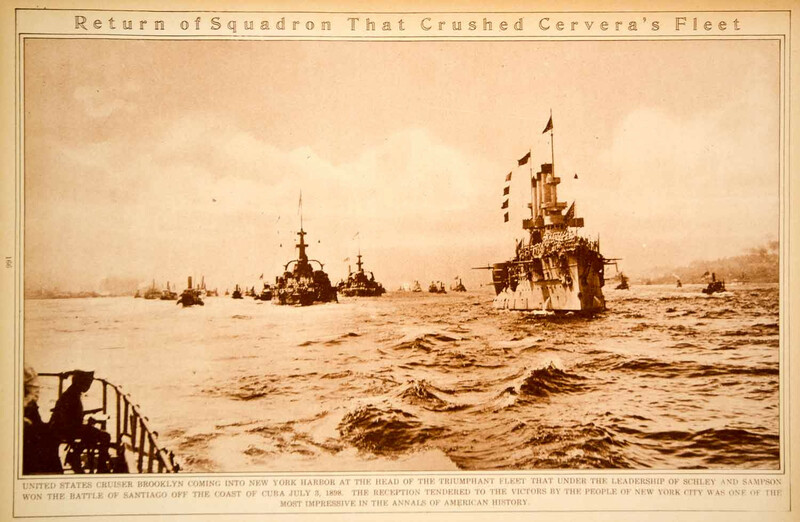 Sampson's Flotilla gives Cervera fleet Hail Columbia. Destroys every vessel and captures the Spanish Admiral and 1600 sailors and marines. 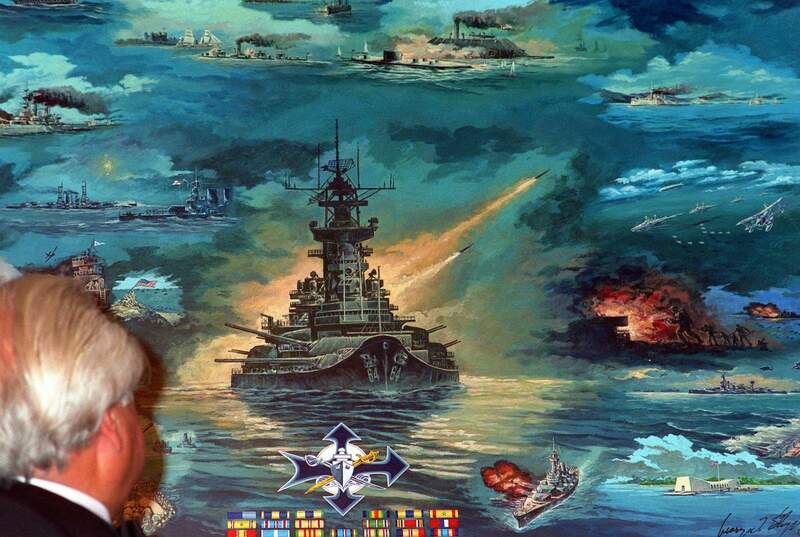 The battleship Iowa (BB-4) under commander Bob Evans takes 600 Spaniards captive The greatest naval victory in history. Fairly eclipses Dewey's feat and makes July 4 1898 a day that will go down in history with July 4 1776. Image and text provided by University of Kentucky, Lexington, KY.
Photo & text by The Breckenridge News. (Cloverport, Ky.) 1876-1955, 06 July 1898, Image 1, via chroniclingamerica.loc.gov. 726k Iowa (BB-4) damage from Spanish fire in Battle of Santiago. Photo by Edward H. Hart, Detroit Publishing Company # 4a14278v from lcweb2.loc.gov. 129k Robert Penn, Fireman Second Class, USN. "An explosion was averted by his quickness." 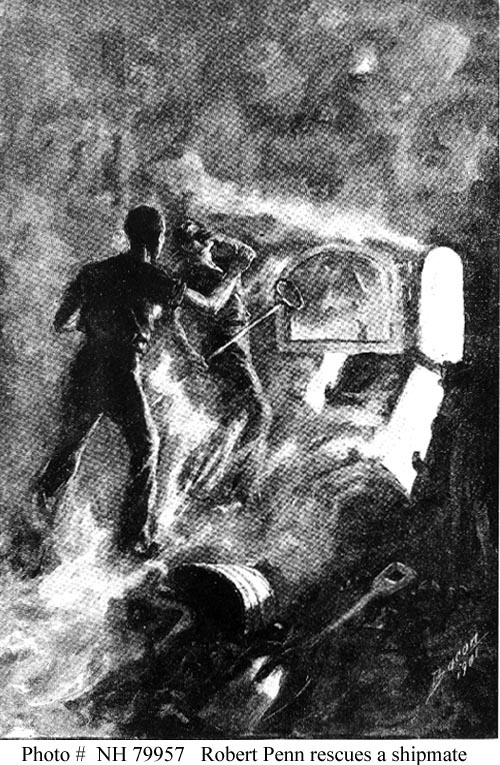 Halftone artwork by Bacon, depicting Robert Penn's heroism during a fire-room accident on board Iowa (BB-4) on 20 July 1898, during the Spanish-American War. He received the Medal of Honor for his actions in that incident. Copied from Deeds of Valor, Volume II, page 405, published in 1907 by the Perrien-Keydel Co., Detroit, Michigan. U.S. Naval Historical Center Photograph # NH 79957. 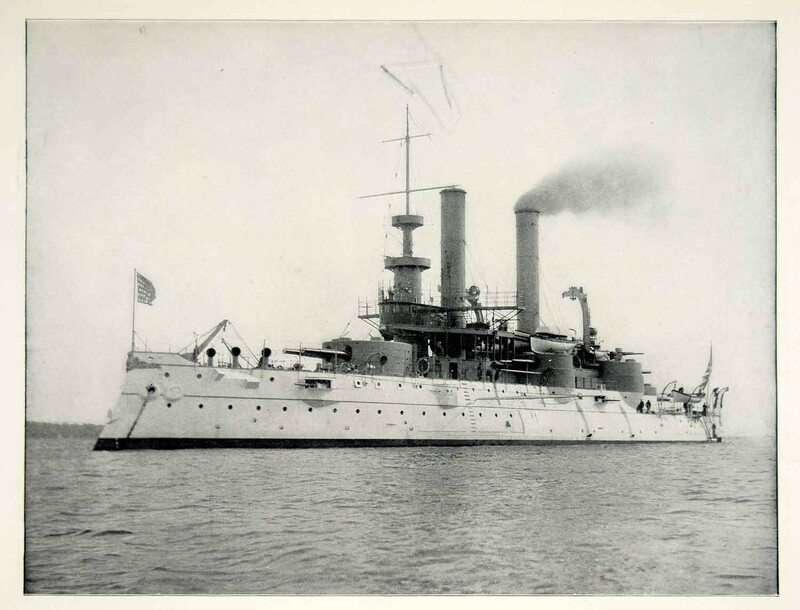 THE BATTLESHIP IOWA (BB-4) Image and text provided by University of North Texas; Denton, TX. Photo & text by Shiner Gazette. (Shiner, Tex.) 1893-current, 20 July 1898, Image 6, via chroniclingamerica.loc.gov. 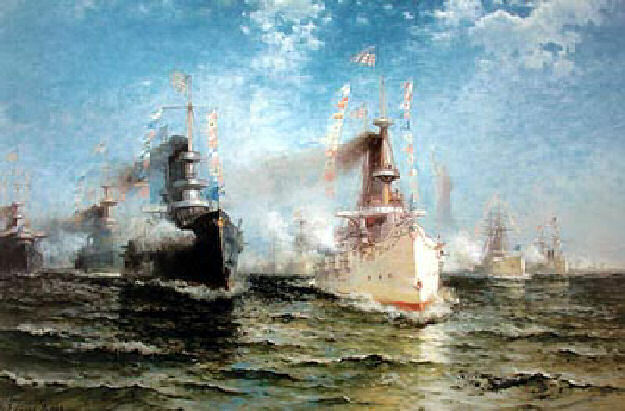 123k Steaming in New York Harbor, escorted by tugs, yachts and other craft, during the Spanish-American War Victory Fleet Review, 21 August 1898. Photographed by F.P. Jewett, Orange, New Jersey. U.S. Naval Historical Center Photograph # NH 1970. 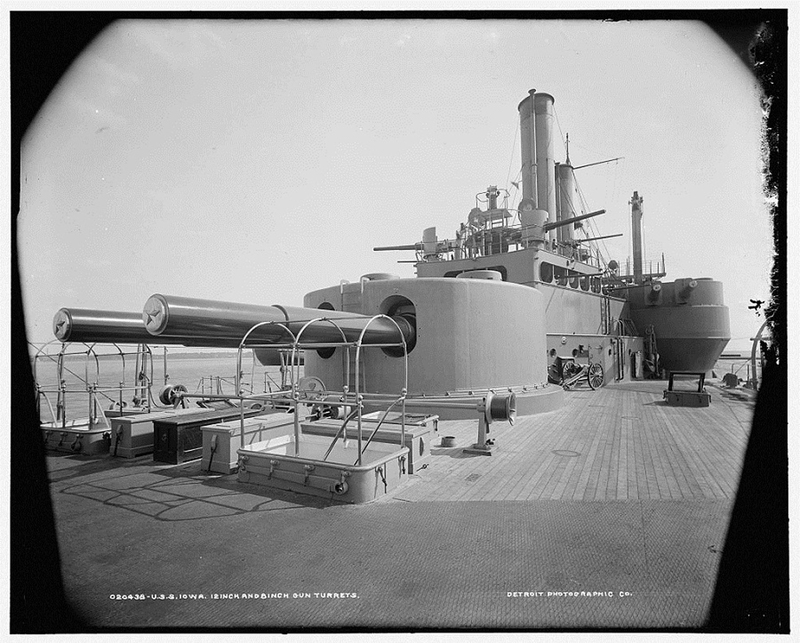 234k Stereoscopic view of the Iowa (BB-4) anchored off New York City during the Spanish-American War Victory Fleet Review, August 1898. Photo courtesy of Tommy Trampp. 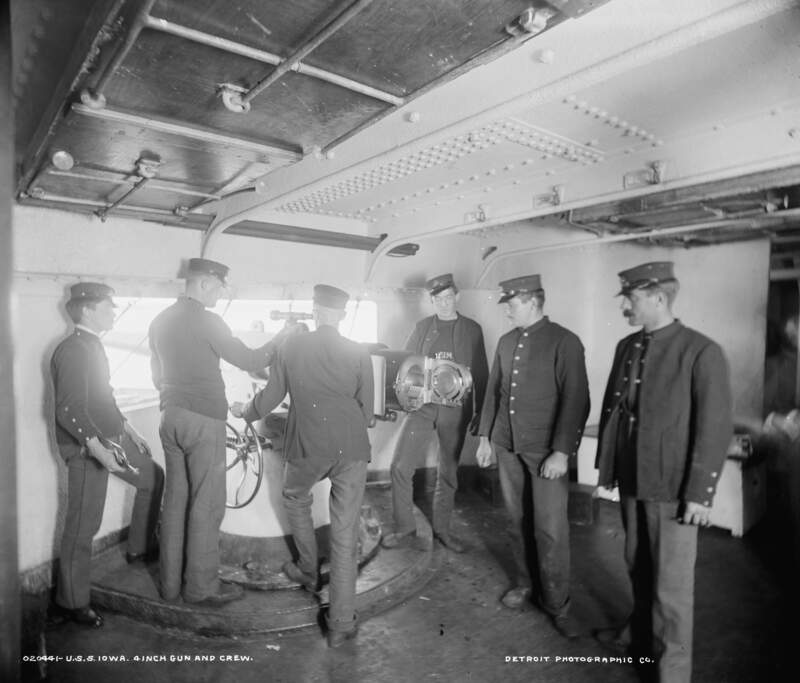 110k Sailors and Marines of the ship's crew posed in front of her forward 12"/35 gun turret, circa August 1898. Photographed by William H. Rau. Note that Iowa (BB-4) has been partially repainted from wartime gray. Also note the ship's bell below the pilothouse. Brooklyn (CA-3) is in the right distance. U.S. Naval Historical Center Photograph # NH 87. 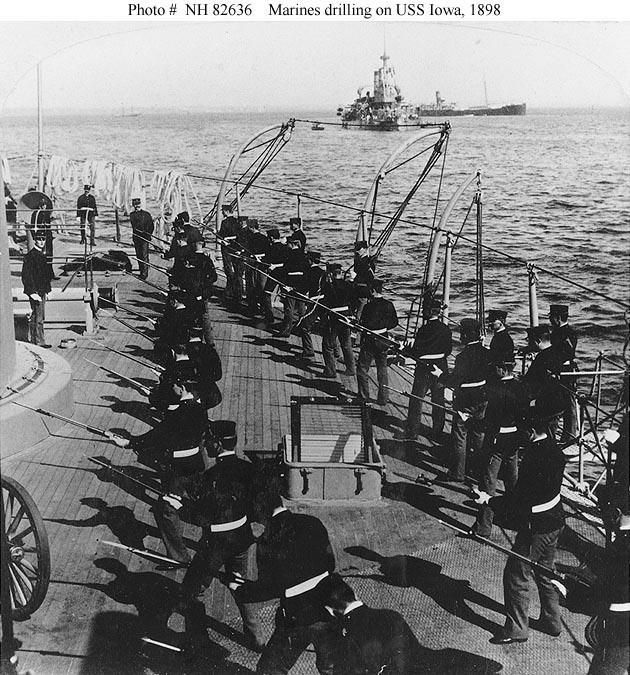 102k Iowa's (BB-4) Marines drilling on deck with rifles and bayonets, 1898. The original photograph was printed on a stereographic card, copyright 1899 by Strohmeyer & Wyman, New York. U.S. Naval Historical Center Photograph # NH 82636. 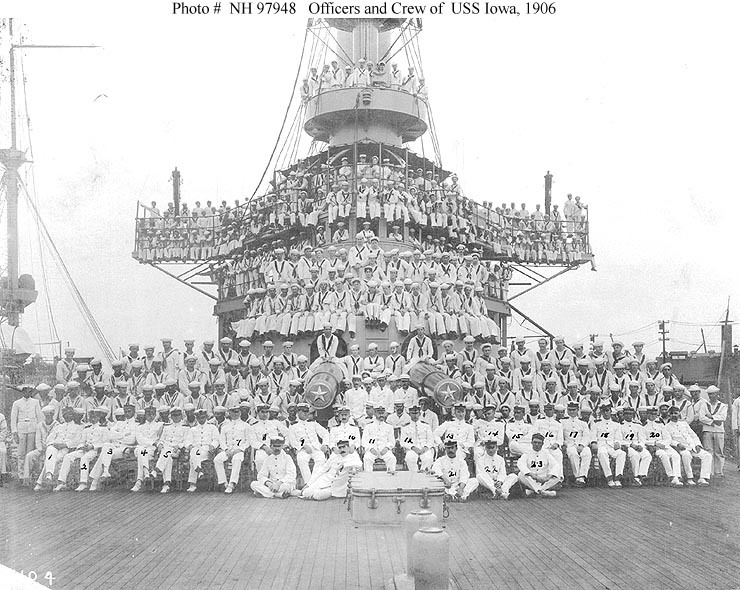 931k Iowa (BB-4) ship's company, 1898? 58k Entering drydock, 1 September 1898. USN / National Archives # 181-NYS-29-97. NR BATTLESHIP IOWA'S (BB-4) NEW COMMANDER, SILAS WRIGHT TERRY Image and text provided by University of North Texas; Denton, TX. Photo & text by The Houston Daily Post. (Houston, Tex.) 1886-1903, 25 September 1898, Mailable Edition, Image 5, via chroniclingamerica.loc.gov. 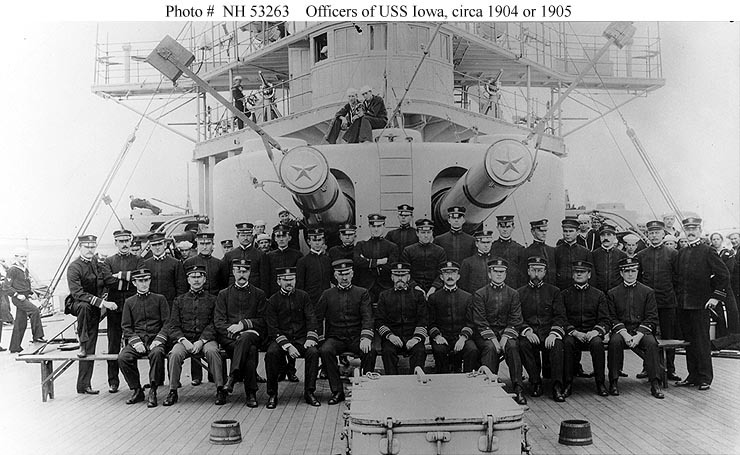 1.2k Captain Silas Wright Terry,(seated 2nd on left) 4th commanding officer of the battleship Iowa (BB-4), poses with his officers circa 1898 � 1899. 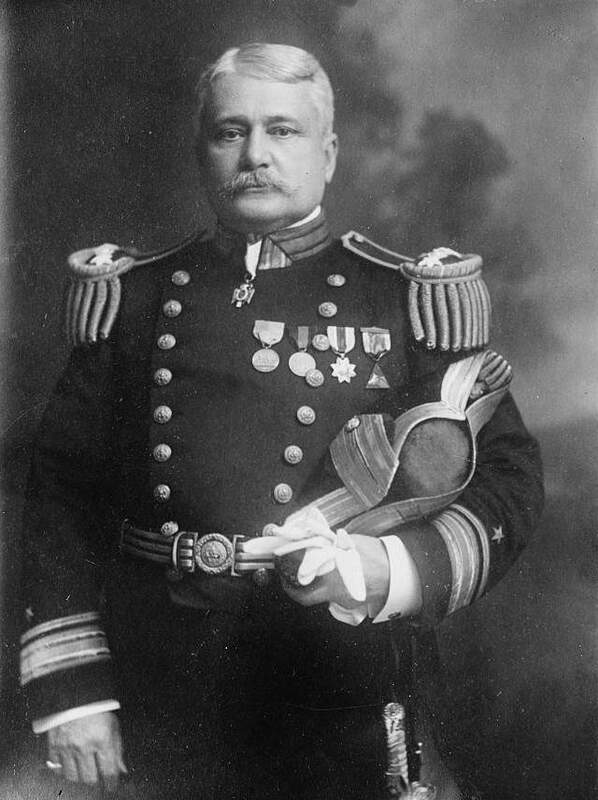 He commanded the battleship Iowa from 24 September 1898 to September 1899. Photo courtesy of the Library of Congress via Bill Gonyo. 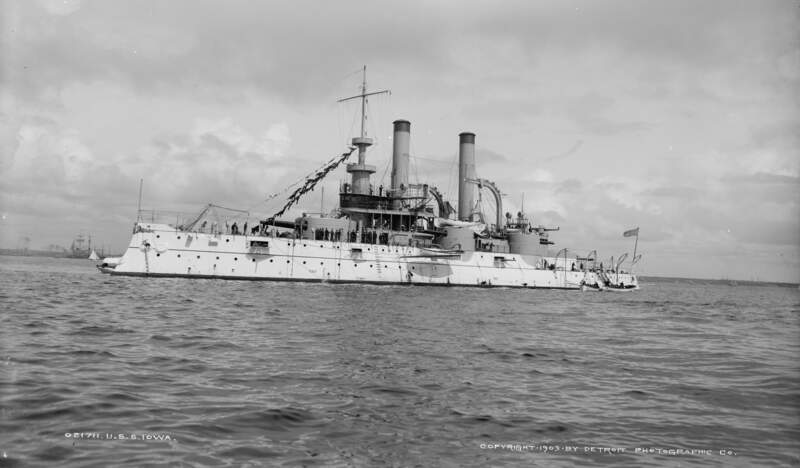 66k In 1899-1900 Captain Goodrich was the 3rd CO of the battleship Iowa (BB-4), from 9.1899 to 9.06.1900. Digital ID: ggbain # 22874. Source: Library of Congress Prints and Photographs Division. Photo courtesy of Bill Gonyo. 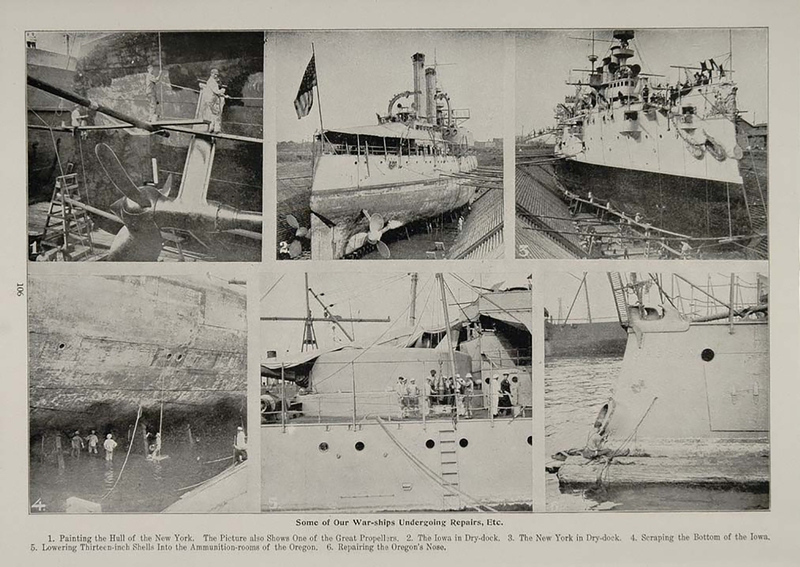 239k The victorious United States fleet off Tompkinsville, S.I. 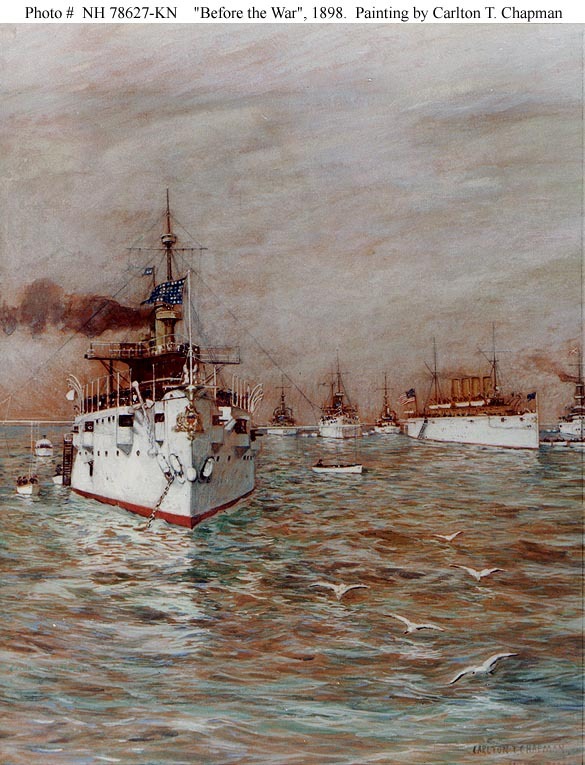 8 October 1898 features the Iowa (BB-4) right center, and two armored cruisers of the New York class (CA-2) (left & center) and other ships of the victorious U.S. fleet. Library of Congress photo by A. Loeffler, courtesy of Library of Congress Prints and Photographs Division Washington, D.C., submitted by Tom Kermen. NR CAPTAIN EVANS AS HE WAS - AND IS. Image and text provided by Library of Virginia; Richmond, VA.
Photo & text by Richmond Planet. (Richmond, Va.) 1883-1938, 29 October 1898, Image 7 via chroniclingamerica.loc.gov. 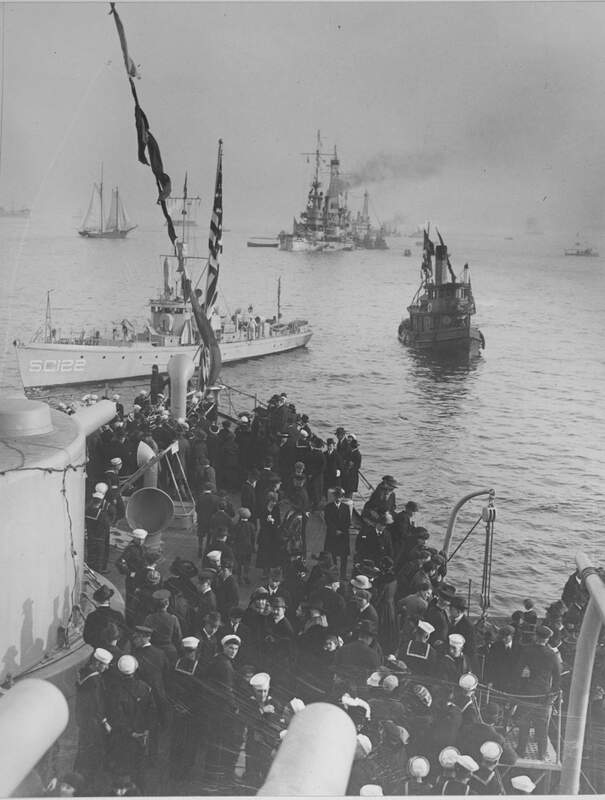 The Battleship Iowa (BB-4) Arrives in Port After Covering the Distance Between New York and San Francisco in 117 Days. Image and text provided by University of California, Riverside. Photo courtesy of The San Francisco Call. (San Francisco [Calif.]) 1895-1913, 08 February 1899, Image 9, via chroniclingamerica.loc.gov. The Water front Was Thronged With Thousands Anxious to Get Aboard. Image and text provided by University of California, Riverside. Photo & text by The San Francisco Call. (San Francisco [Calif.]) 1895-1913, 13 February 1899, Image 8, courtesy of chroniclingamerica.loc.gov. NR IN HONOR OF WASHINGTON'S BIRTHDAY. "EVERY ship in port flew her colors yesterday out of respect for the natal day of "the father of his country." 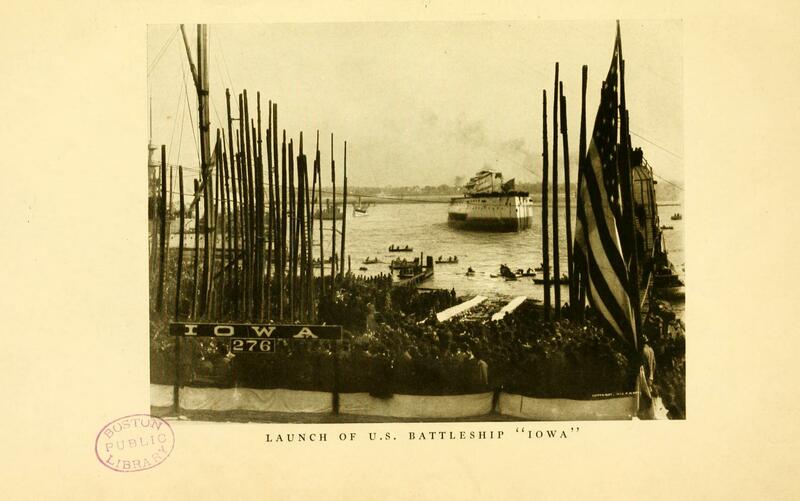 The battleship Iowa (BB-4) was decked from stem to stern with flags, and a short distance from her the British ship Centesima made an equally good showing, while the British steamer Moana at Pacific-street wharf and the transports Roanoke and Connemaugh were covered with bunting. During the day the Mexican war veterans visited the Iowa. At noon the battleship fired a national salute, as did also the batteries at Fort Point, Black Point and Alcatraz. Image and text provided by University of California, Riverside. Photo & text by The San Francisco Call. (San Francisco [Calif.] 1895-1913, 23 February 1899, Image 9, courtesy of chroniclingamerica.loc.gov. 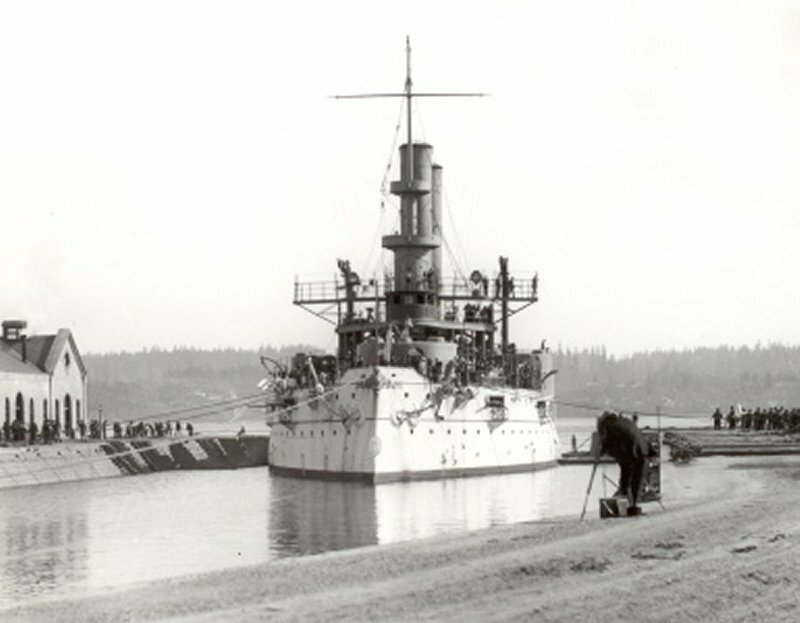 NR BATTLESHIP IOWA (BB-4), LARGEST OF HER CLASS, COMING TO PUGET SOUND Image and text provided by Washington State Library; Olympia, WA. Photo & text by The Seattle Post-Intelligencer. (Seattle, Wash. Terr. [Wash.]) 1888-1914, 06 April 1899, Image 12, via chroniclingamerica.loc.gov. NR BATTLESHIP IOWA (BB-4) FIRES THE ADMIRAL'S SALUTE. CALIFORNIANS DO HONOR TO GEORGE DEWEY Image and text provided by University of California, Riverside. Photo & text by The San Francisco Call. (San Francisco [Calif.]) 1895-1913, 02 May 1899, Image 2, courtesy of chroniclingamerica.loc.gov. Willie Barlow, Guest on the Man-of-War. Image and text provided by University of California, Riverside. Photo courtesy of The San Francisco Call. (San Francisco [Calif.]) 1895-1913, 20 June 1899, Image 12, via chroniclingamerica.loc.gov. For the First Time in the History of the Port a Warship Clears for Action Image and text provided by University of California, Riverside. Photo courtesy of The San Francisco Call. (San Francisco [Calif.]) 1895-1913, 14 October 1899, Image 14, via chroniclingamerica.loc.gov. NR THE OPERATION OF COALING THE BATTLESHIP IOWA (BB-4). THE record of the coast was broken yesterday in the supplying of the big warship with fuel. A thousand tons was put aboard in eight hours, or an average of 125 tons an hour. 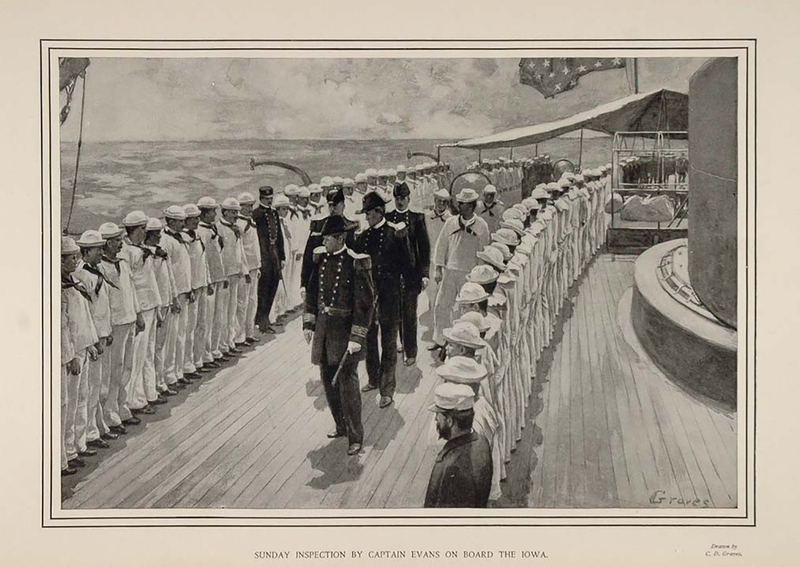 It was a case of rivalry between the port and starboard watches, and the officers were as much interested in the contest as the men. A blackboard was hung on the fighting mast, and every hour the tally of each watch was given. When the day's work was done it was about a standoff between the two gangs. Photo courtesy of The San Francisco Call. (San Francisco [Calif.]) 1895-1913, 12 December 1899, Image 7, via chroniclingamerica.loc.gov. 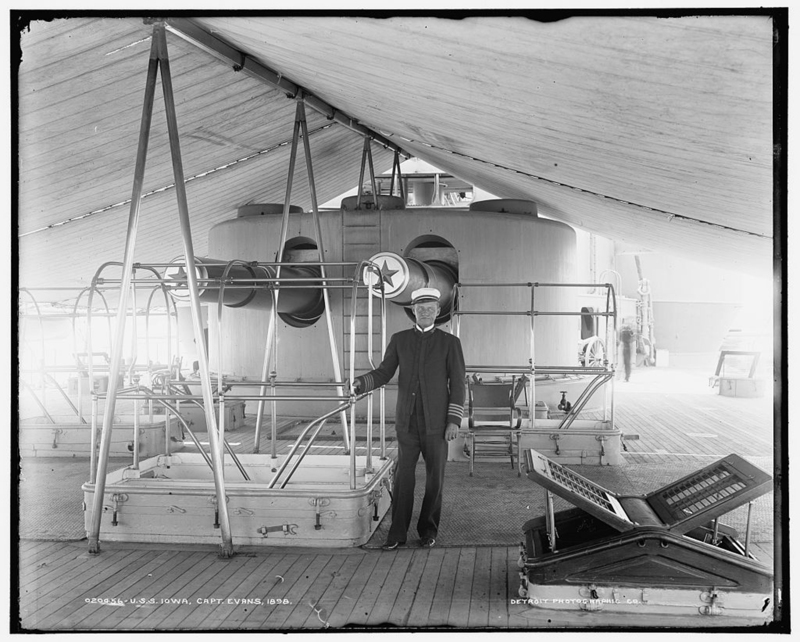 814k Inspection & airing out of bedding aboard the Iowa (BB-4), circa 1900. 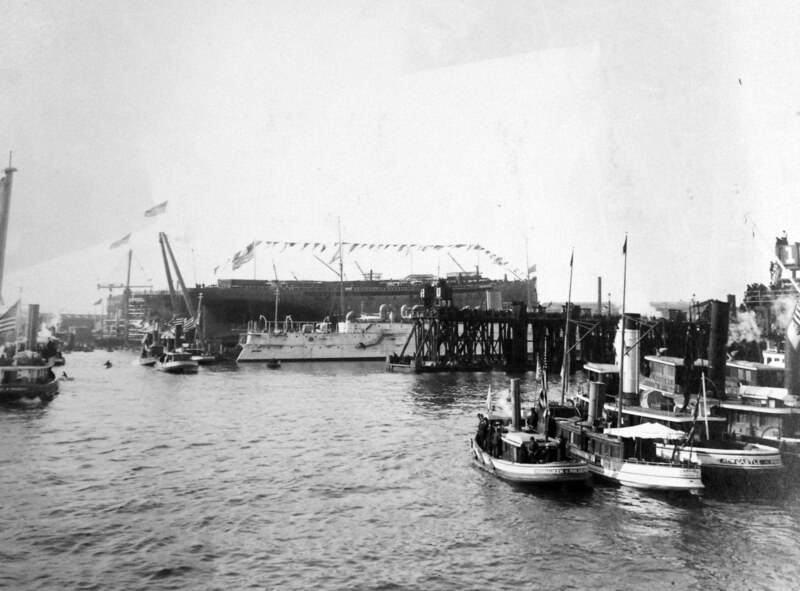 7 58k Iowa (BB-4) entering drydock at Port Orchard, Naval Station Puget Sound, Washington, 28 April 1900. USN / National Archives photo. Text i.d. courtesy of Nick Collecchi. 597k Circa turn of the century photo of the Iowa (BB-4) in living color. USN photo courtesy of Darryl L. Baker. BATTLESHIP IOWA (BB-4) & Cruiser Philadelphia (C-4) Image and text provided by University of California, Riverside. Photo & text by The San Francisco Call. (San Francisco [Calif.] 1895-1913, 17 August 1901, Image 1, courtesy of chroniclingamerica.loc.gov. Cruiser Philadelphia (C-4) Goes to Mare Island Navy Yard to Be Prepared for a Voyage That May Bring Up at Panama. Image and text provided by University of California, Riverside. Photo & text by The San Francisco Call. (San Francisco [Calif.] 1895-1913, 17 August 1901, Image 7, courtesy of chroniclingamerica.loc.gov. NR Battleship Iowa (BB-4) going into the new drydock at Puget Sound Naval Station at Bremerton. Photo by Enrique Muller Jr,. Photo & text by New-York Tribune. (New York [N.Y.]) 1866-1924, 01 September 1901, Page 3, Image 29 via chroniclingamerica.loc.gov. Photo & text by The San Francisco Call. (San Francisco [Calif.]) 1895-1913, 26 November 1901, Image 1 via chroniclingamerica.loc.gov. COMMANDING OFFICER OF THE BATTLESHIP IOWA (BB-4), WHO TOOK SUCH AN IMPORTANT PART IN MAINTAINING FREE TRANSIT ACROSS THE ISTHMUS OF PANAMA DURING THE RECENT REVOLUTION IN COLOMBIA, AND A SCENE ALONG THE PROPOSED ROUTE OF THE ISTHMIAN CANAL. Image and text provided by University of California, Riverside. Photo from The San Francisco Call. (San Francisco [Calif.]) 1895-1913, 07 December 1901, Image 2, via chroniclingamerica.loc.gov. NR BATTLESHIP IOWA (BB-4) AND ROUTE OF PANAMA RAILROAD GUARDED BY HER MARINES. DESPITE the row between the Colombian government and the Colombian insurgents the railroad across the isthmus of Panama is running trains nearly on schedule time, because it is guarded by United States marines from the battleship Iowa and the gunboats Machias and Marietta, under command of Captain Perry of the Iowa. Image and text provided by Minnesota Historical Society; Saint Paul, MN. Photo & text by The Saint Paul Globe.(St. Paul, Minn.) 1896-1905, 01 December 1901, Image 14, via chroniclingamerica.loc.gov. 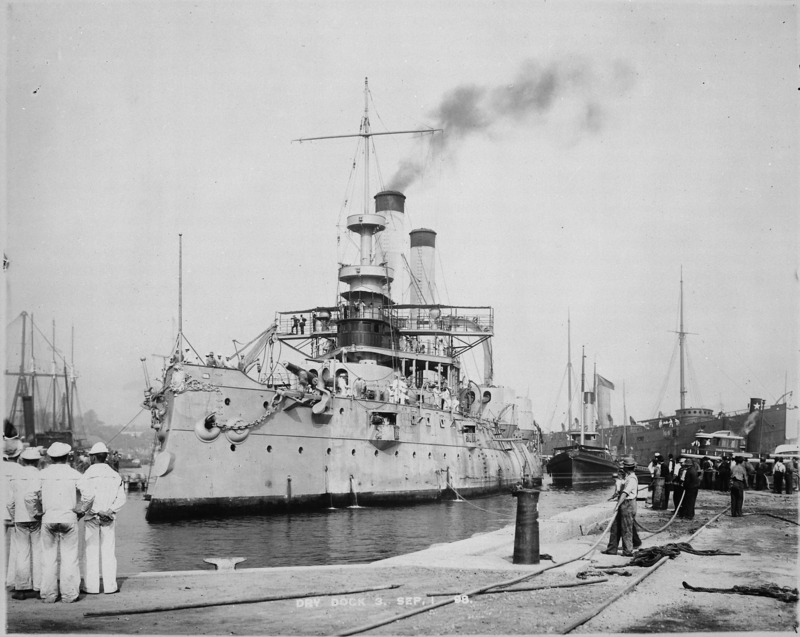 2.42k Iowa (BB-4) in a harbor, circa the early 1900s. USN photo # NH 61211 courtesy of U.S. Naval History and Heritage Command Photograph from the National Archives & National Museum of the U.S. Navy via flickr.com. 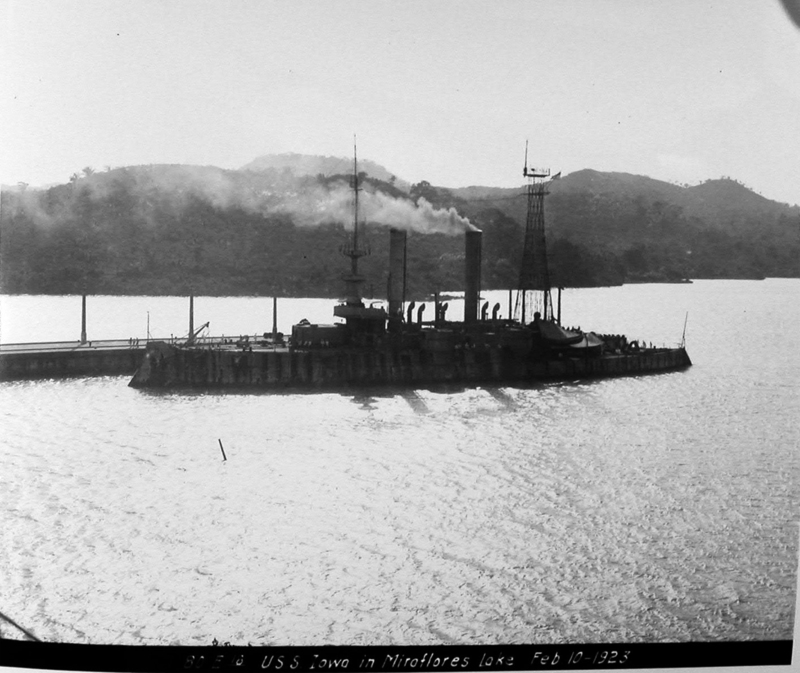 683k Iowa (BB-4) departing the Golden Gate in 1902. Notice there is no bridge and Fort Point is on the left. USN photo courtesy of Darryl L. Baker. NR TWELVE INCH GUN BURSTS ON BATTLESHIP IOWA (BB-4) KILLING THREE. Great Holes Are Torn in the Vessel by Missiles, Which Seriously Wound Five. The men killed and injured were on the second gun deck at mess. Photo of the battleship as she appeared recently while in dry-dock. Image and text provided by Montana Historical Society; Helena, MT. Photo from The Butte Inter Mountain. (Butte, Mont.) 1901-1912, 10 April 1903, Image 1, via chroniclingamerica.loc.gov. 750k THE BATTLESHIP IOWA (BB-4), ON WHICH OCCURRED THE FATAL EXPLOSION Image and text provided by University of Hawaii at Manoa; Honolulu, HI. Photo from The Pacific Commercial Advertiser. (Honolulu, Hawaiian Islands) 1885-1921, 11 April 1903, Image 7, via chroniclingamerica.loc.gov. 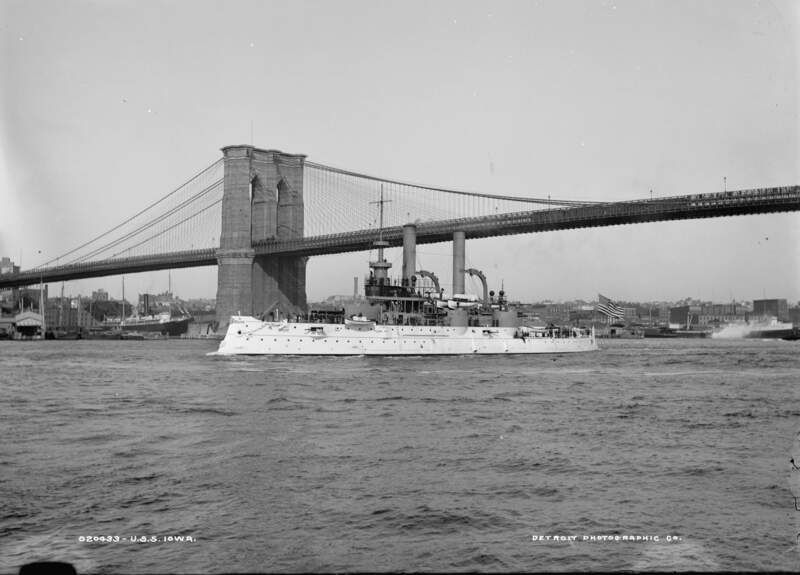 625k Iowa (BB-4) sailed for New York 12 February 1903 where she decommissioned 30 June 1903. 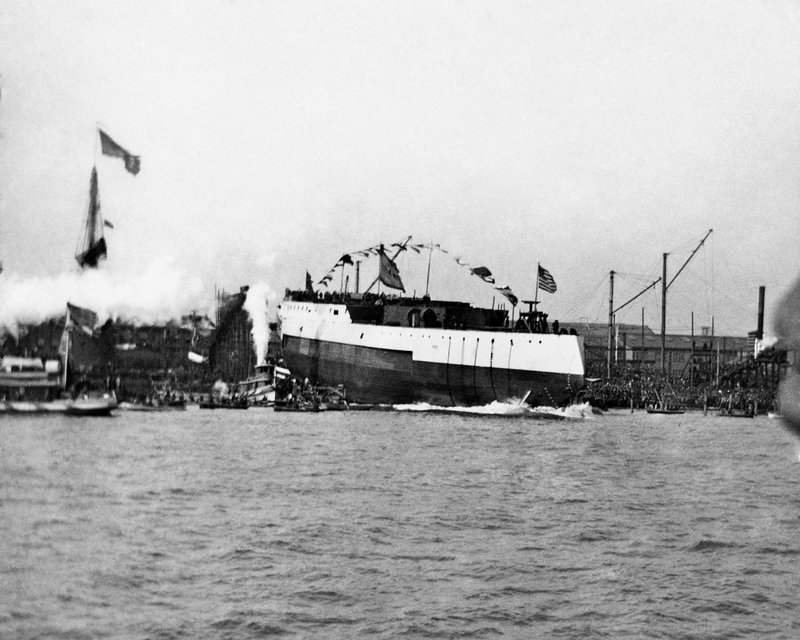 She is seen here at Brooklyn Navy Yard sometime in 1903. Text courtesy of DANFS. 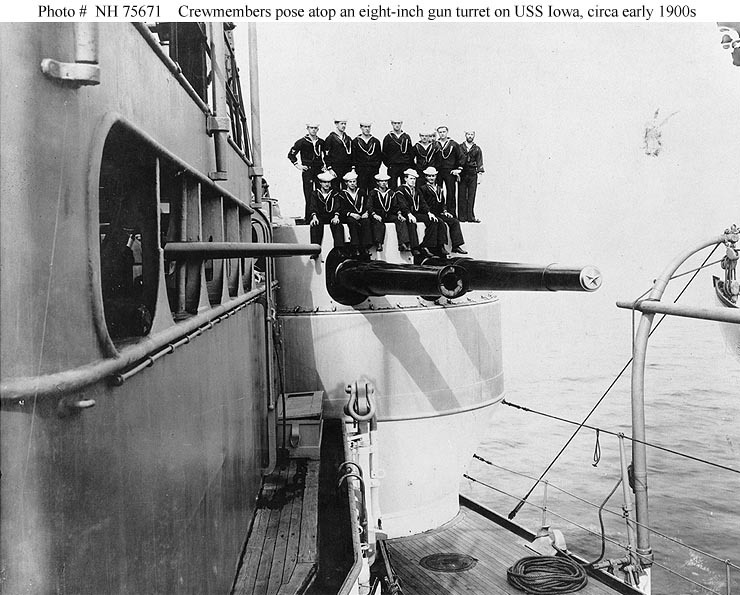 103k Crew-members posed atop her after starboard 8"/35 gun turret, circa the early 1900s. 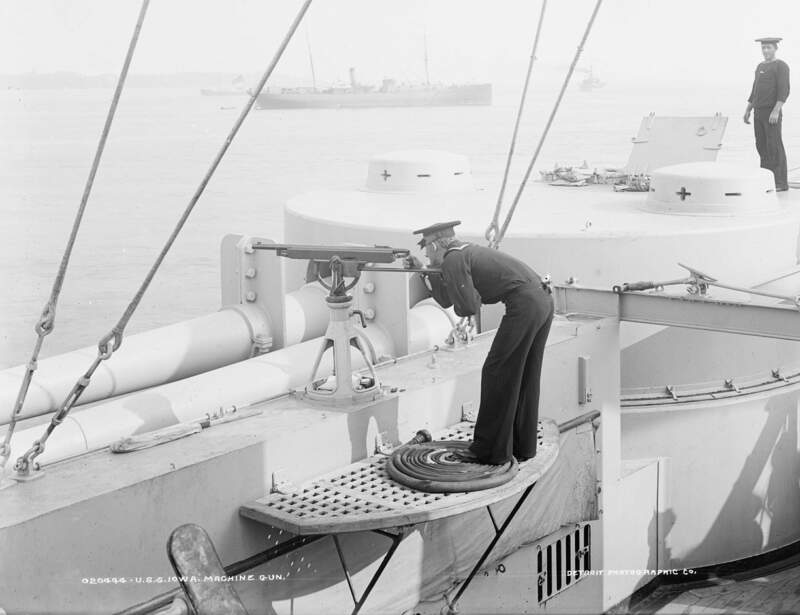 Note that the inboard gun has its muzzle blown off, presumably the result of an accident. U.S. Naval Historical Center Photograph # NH 75671. 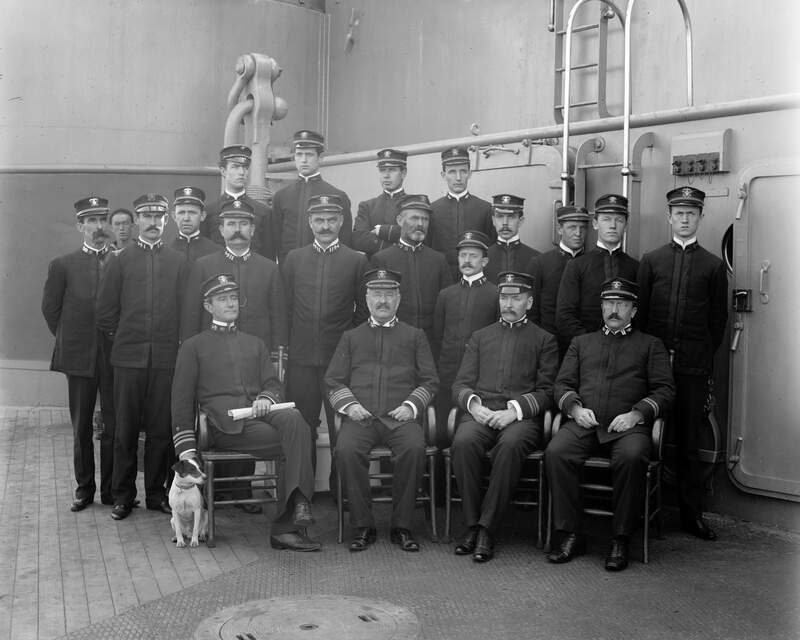 92k Ship's officers posed on her foredeck, circa 1904 or 1905. Lieutenant Commander William S. Benson, the Executive Officer, is fifth from the left, in the front row. Seated just to the right of Benson, is probably Captain Benjamin F. Tilley, Iowa's (BB-4) 7th Commanding Officer. If it is Tilley, the photo was taken in January-August 1905. U.S. Naval Historical Center Photograph # NH 53263. 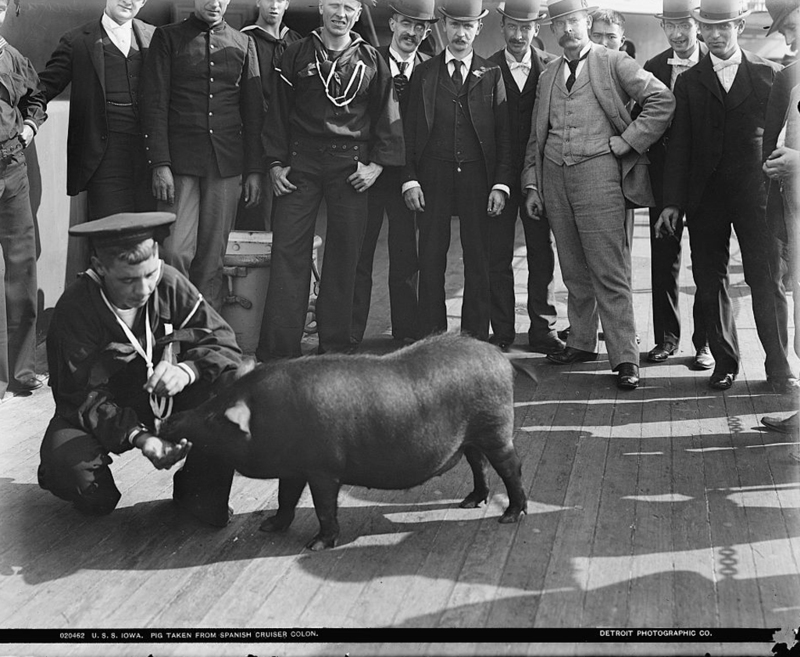 626k Iowa (BB-4) recommissioned 23 December 1903 and joined the North Atlantic Squadron. She participated in the John Paul Jones Commemoration ceremonies, 30 June 1905. 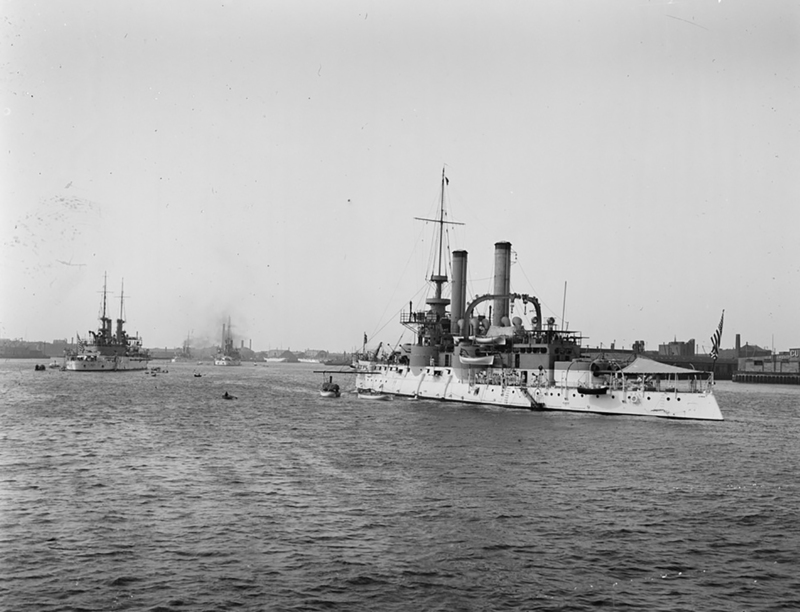 Iowa appears here in Boston Harbor possibly circa 1905. Of the two battleships in the near distance, the Alabama (BB-8) is the closest, leaving the Illinois (BB-7) as the only choice. A Indiana (BB-01/03) class appears beyond her, with a Maine (BB-10/12) or Virginia class BB-13/17 docked in the distance. Text courtesy of DANFS. Photo i.d. courtesy of Richard M. Jensen. 420k The Iowa (BB-4) in the New United States Floating Dry Dock Dewey (YFD-1) (Largest in the World)." Maker: Polychrome A-7642 Published by The American News Company New York, Leigzig, Dresden. Printed in Germany. No copyright. Picture taken 23-June-1905 in the Patuxent River MD. 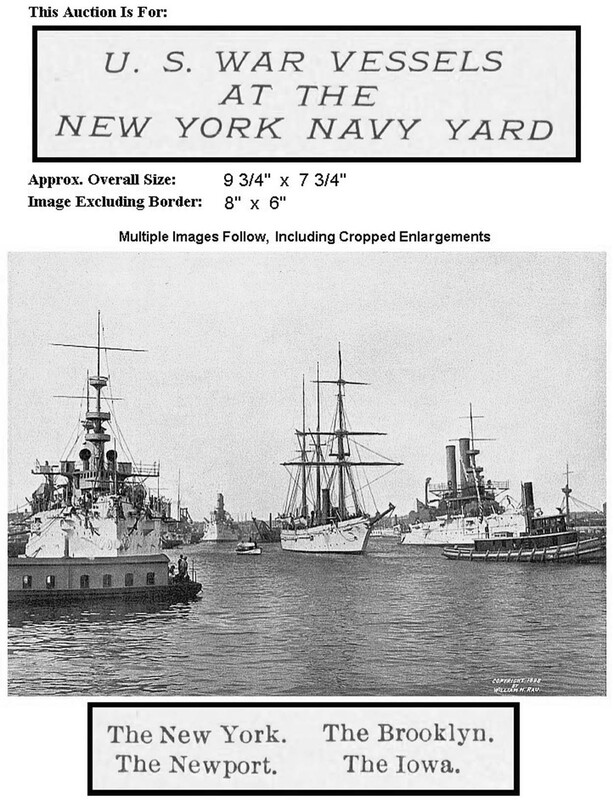 Postmarked 03-January-1912 aboard Potomac (AT-50), probably at Norfolk Navy Yard. 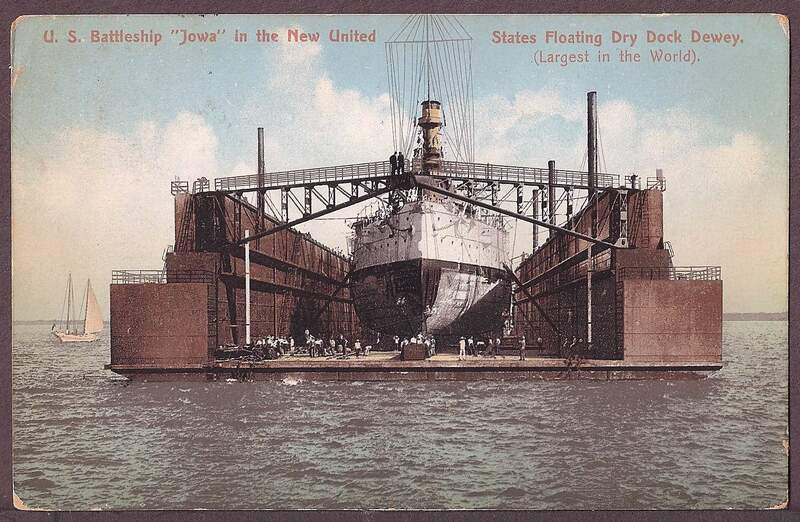 The Dewey Dry Dock was launched 10-June-1905 at Sparrows Point MD and towed to deep water in the Patuxent River. On Friday 23-June the Dewey's first test lift was armored cruiser Colorado (ACR-7), her second test was the Iowa. Dewey passed both tests with flying colors. Photo & text courtesy of Bruce D. Liddell. 2.07k 120 days at sea on the biggest craft afloat. Image and text provided by Library of Congress, Washington, DC. Photo from The Washington Times. (Washington [D.C.]) 1902-1939, 07 January 1906, Magazine Section, Image 48, via chroniclingamerica.loc.gov. Photo from The Jackson Herald. (Jackson, Mo.) 1897-1911, 22 February 1906, Image 5, via chroniclingamerica.loc.gov. 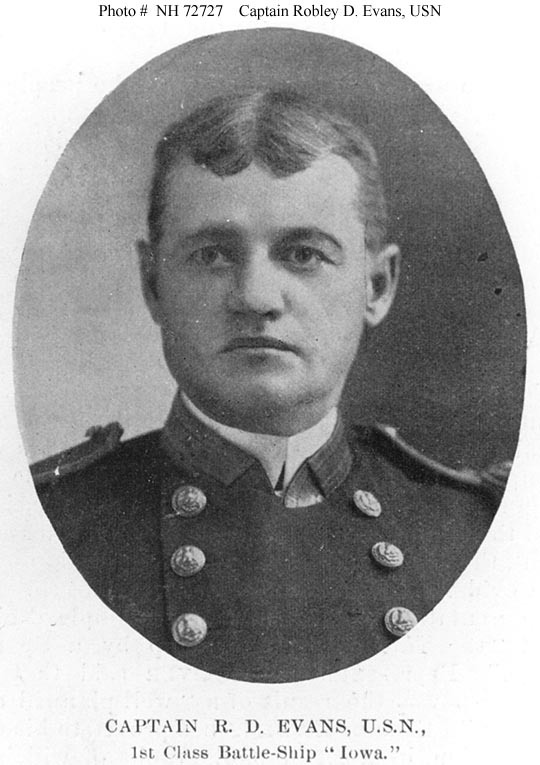 CAPT HENRY McCREA, Former Lighthouse Inspector of Baltimore District is to Command Iowa (BB-4). Image and text provided by Library of Congress, Washington, DC. Photo from The Washington Times. (Washington [D.C.]) 1902-1939, 10 December 1906, Last Edition, Image 2, via chroniclingamerica.loc.gov. 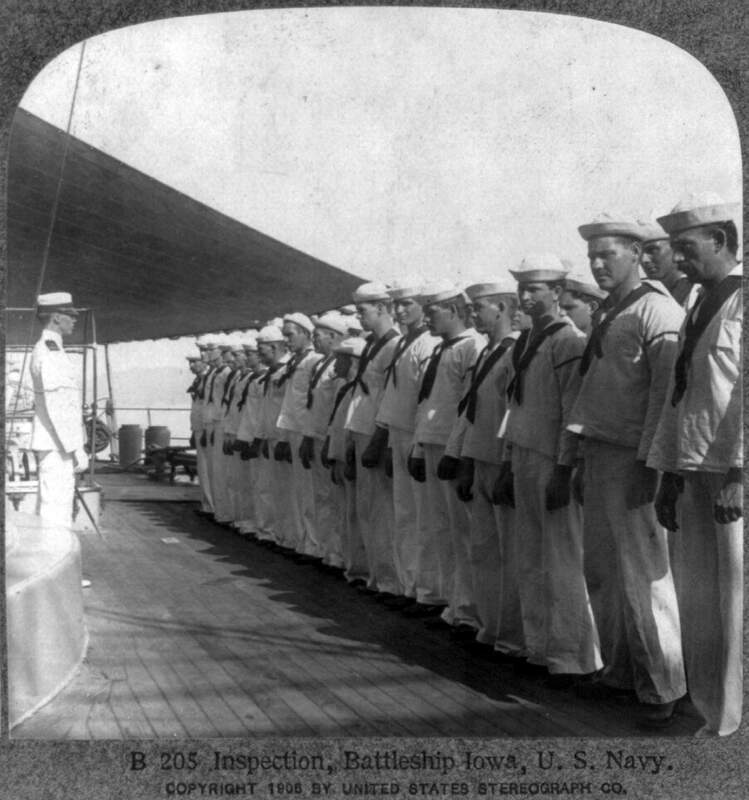 186k U.S. Navy Sailors lined up for inspection on the battleship Iowa (BB-4) in 1906. Digital ID:cph 3b07267. Source: Library of Congress Prints and Photographs Division. Photograph submitted by Bill Gonyo. 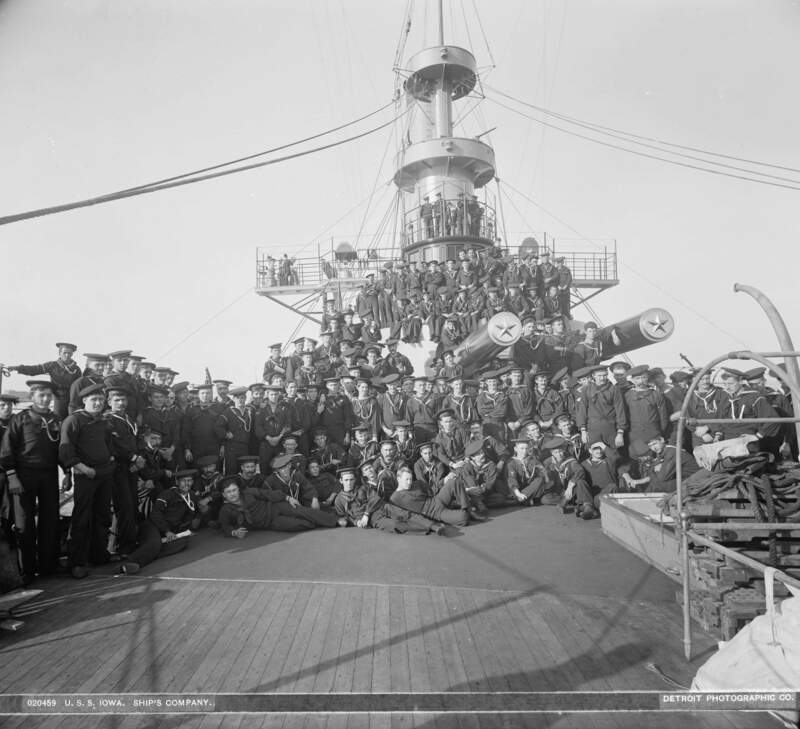 121k Ship's officers and crew pose on her foredeck, forward 12"/35 gun turret and superstructure, 1906. U.S. Naval Historical Center Photograph # NH 97948. 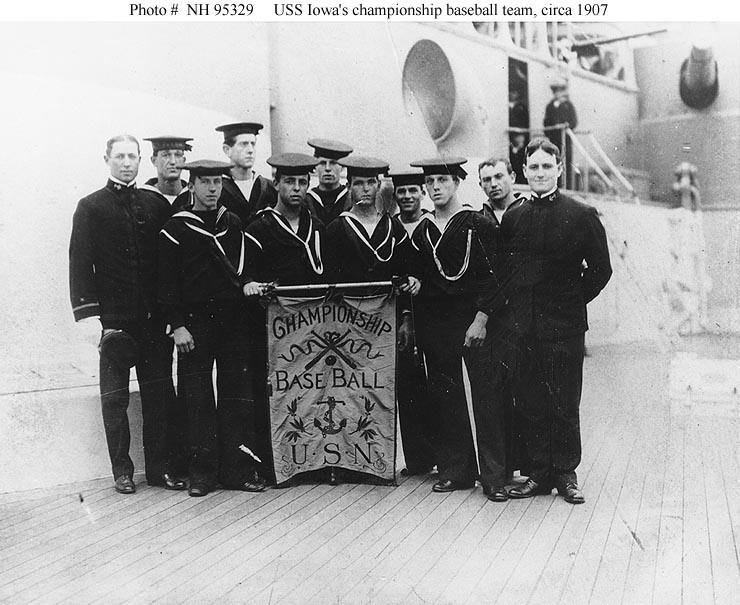 92k Member's of the ship's championship baseball team, circa 1907. U.S. Naval Historical Center Photograph # NH 95239. 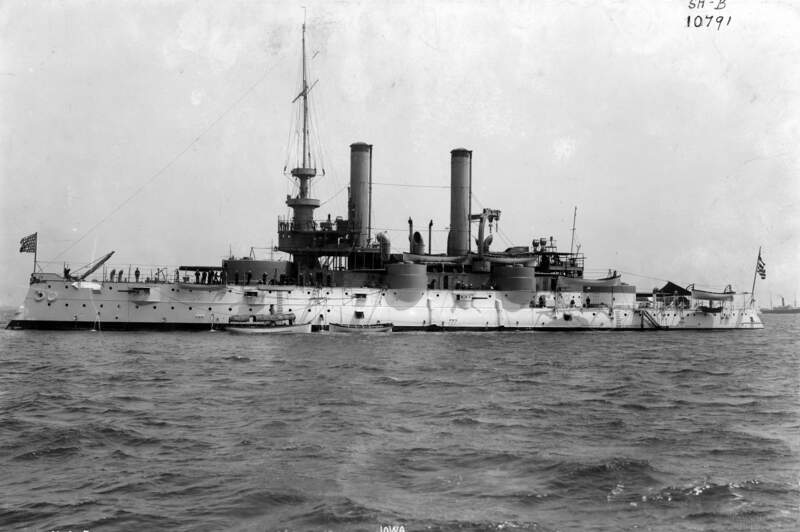 1.43k BATTLESHIP IOWA (BB-4) WHICH IS BEING RAPIDLY EQUIPPED FOR LONG VOYAGE Image and text provided by Library of Virginia; Richmond, VA.
Photo from The Times Dispatch. (Richmond, Va.) 1903-1914, 10 July 1907, Image 3, via chroniclingamerica.loc.gov. 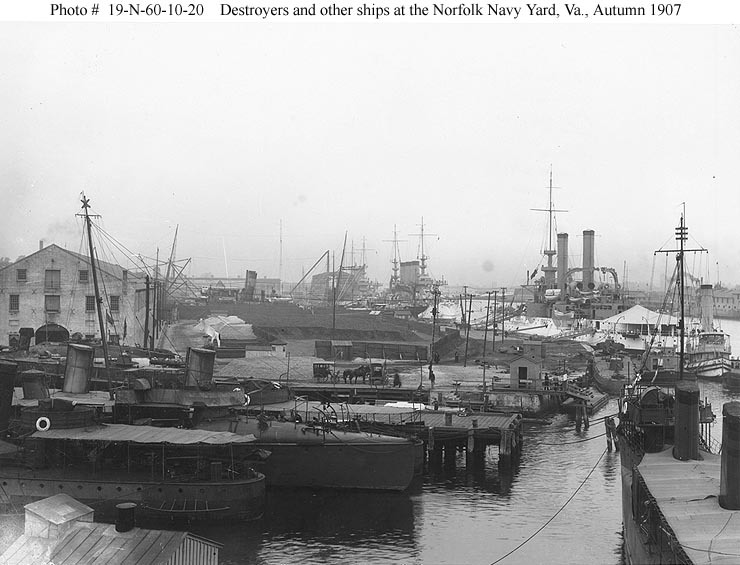 79k Norfolk Navy Yard, Virginia Waterfront scene, Autumn 1907. Ships at left are (from front to rear): Hopkins (DD-6); Lawrence (DD-8); Hull (DD-7); Talbot (Torpedo Boat # 15) and Moccasin A-4 (SS-5). The latter two are hauled out on the marine railway. Stewart (DD-13) is in the right foreground. Ahead of her are a torpedo boat, a barge and the tug Mohawk. 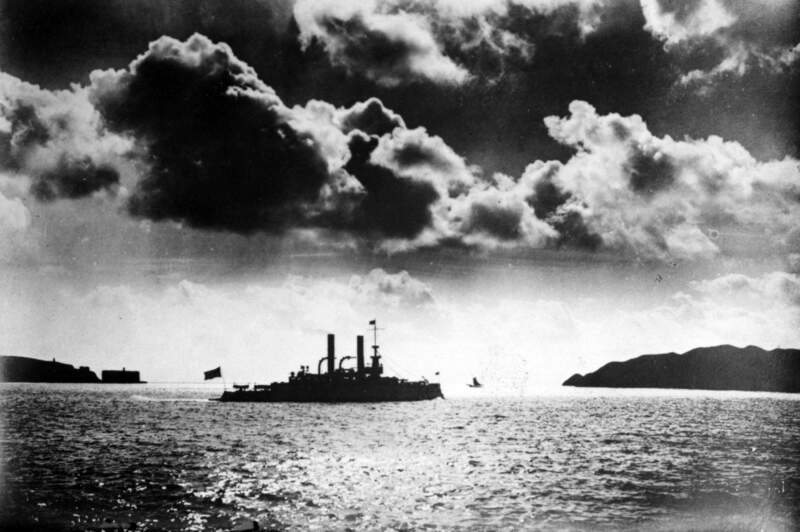 Three battleships are docked beyond them, with Iowa (BB-4) furthest to the right. 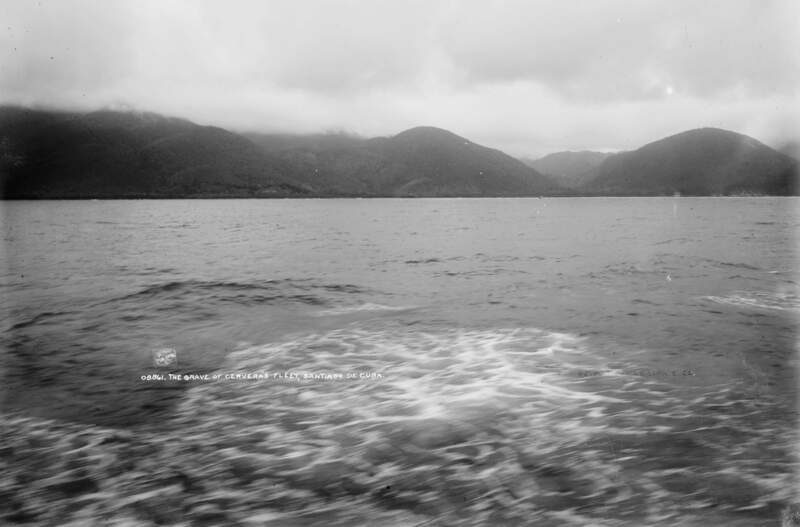 Photograph # 19-N-60-10-20 from the Bureau of Ships Collection in the U.S. National Archives. 1908, THE DELAWARE (BB-28), LARGEST BATTLESHIP, 1898, THE IOWA (BB-4) LARGEST BATTLESHIP Image and text provided by Minnesota Historical Society; Saint Paul, MN. Photo from The Appeal. (Saint Paul, Minn.) 1889-19? ?, 21 March 1908, Image 1, via chroniclingamerica.loc.gov. 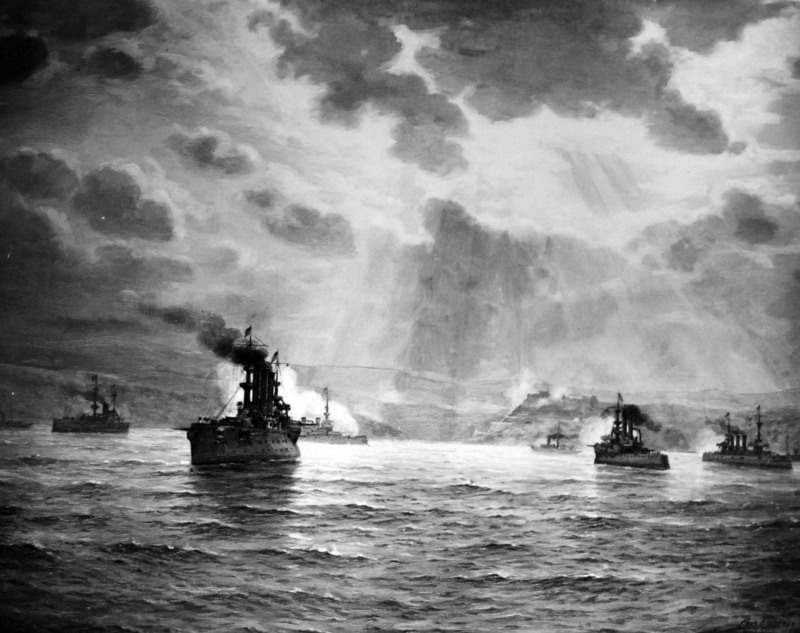 69k 2 August 1908 � A new Eastern Seaboard Squadron of fighting ships will be formed under the command of Rear Admiral Conway H. Arnold. The Battleship Iowa (BB-4) will carry the Admiral's flag. The new squadron includes the battleships New Hampshire (BB-25), Idaho (BB-24), Mississippi (BB-23), and Iowa. Also included in the squadron are the armored cruisers Montana (ACR-13) and North Carolina (ACR-12). Also joining the squadron will be the soon to be commissioned battleships Indiana (BB-1) and Massachusetts (BB-2). Information compiled from the New York Times. Digital ID: ggbain 03554. Source: Library of Congress Prints and Photographs Division. Photograph submitted by Bill Gonyo. 96k Society of Sponsors of the U.S. Navy. 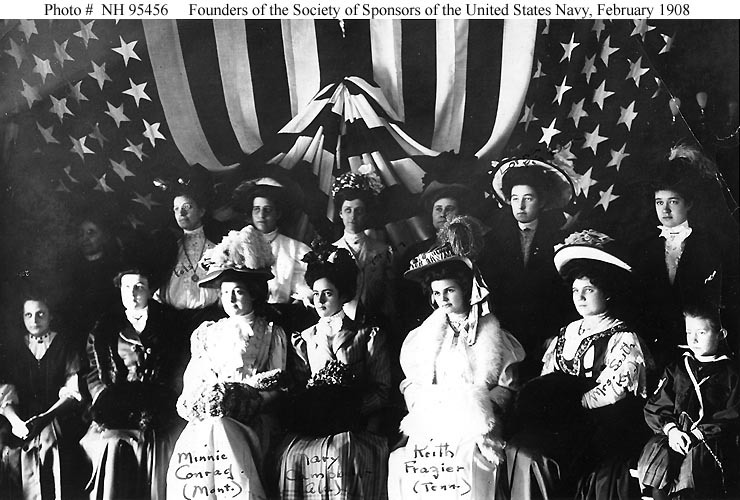 Attendees at the Society's organizational meeting, in Washington, D.C., February 1908. The photograph was given to the Society by Mrs. Annie Keith Frazier Somerville, one of its founders. Her mother had sent a photographer to Washington's Willard Hotel to take this view. The fourteen sponsors present to organize the Society were (Those identified on the photograph are marked "**"): Mrs. G.F. Toland; ** Mrs. John P. Pels (Miss R.W. Wright), Sponsor of Denver (C-14); ** Mrs. Earl Morgan (Miss Elizabeth Stephenson), Sponsor of Wisconsin (BB-9); Miss Helen Duchler, Sponsor of Ohio (BB-12); Mrs. George Sturdevant (Miss M.L. Drake), Sponsor of Iowa (BB-4); ** Miss Lorna Pinnock, Sponsor of Salem (CS-3); Miss Harriet Rankin; Miss Dorothy Sproul, Sponsor of Chester (CS-1); Miss Ida May Shearer; ** Miss Mary Campbell, Sponsor of Birmingham (CS-2); ** Miss Keith Frazier, Sponsor of Tennessee (ACR-10); ** Mrs. John South (Miss Christine Bradley), Sponsor of Kentucky (BB-6); ** Miss Minnie Conrad, Sponsor of Montana (ACR-13). The little girl is Miss Eleanor Gow. U.S. Naval Historical Center Photograph # NH 95456, collection of the Society of Sponsors of the U.S. Navy. 53k The Iowa (BB-4) all decked up with flags, possibly at the ceremony marking her decommissioning at Philadelphia, 23 July 1908. U.S. National Archives photo (NARA), courtesy of USNI. 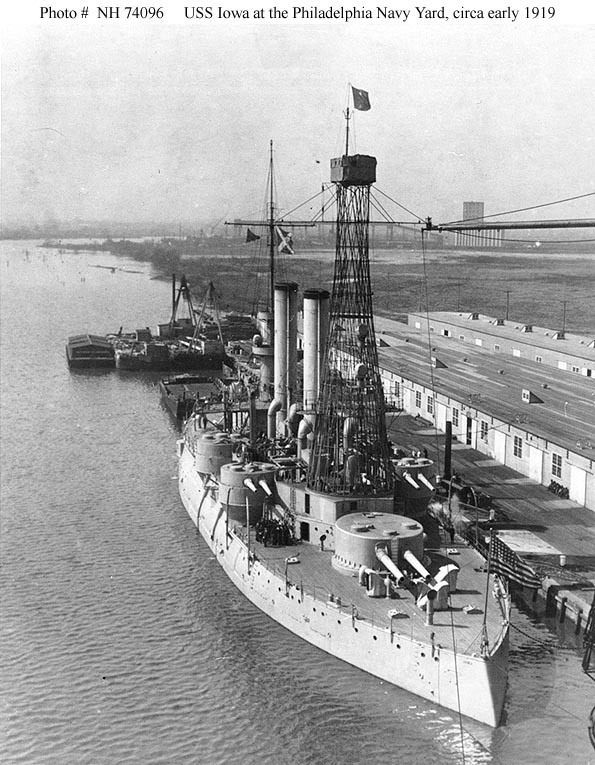 700k Colliers water front of U.S. Navy yard, Norfolk, Va. Iowa (BB-4) remained in the North Atlantic until she was placed in reserve 6 July 1907. 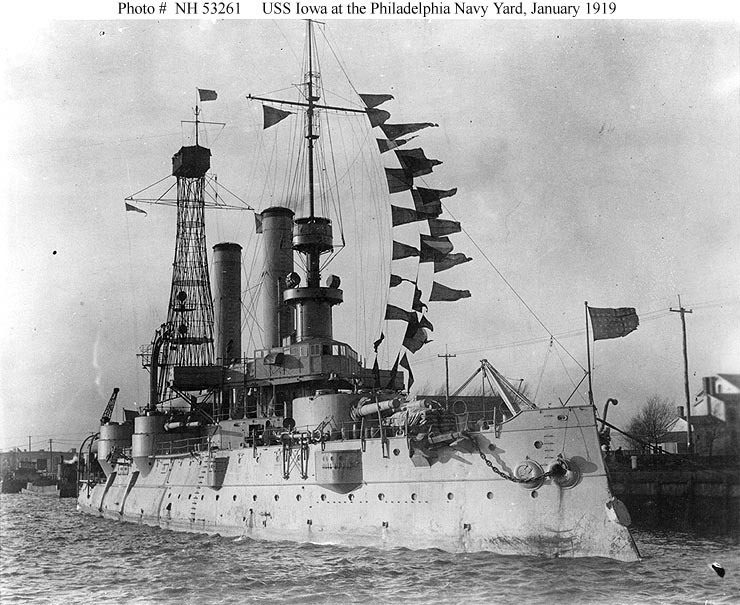 She decommissioned at Philadelphia 23 July 1908. 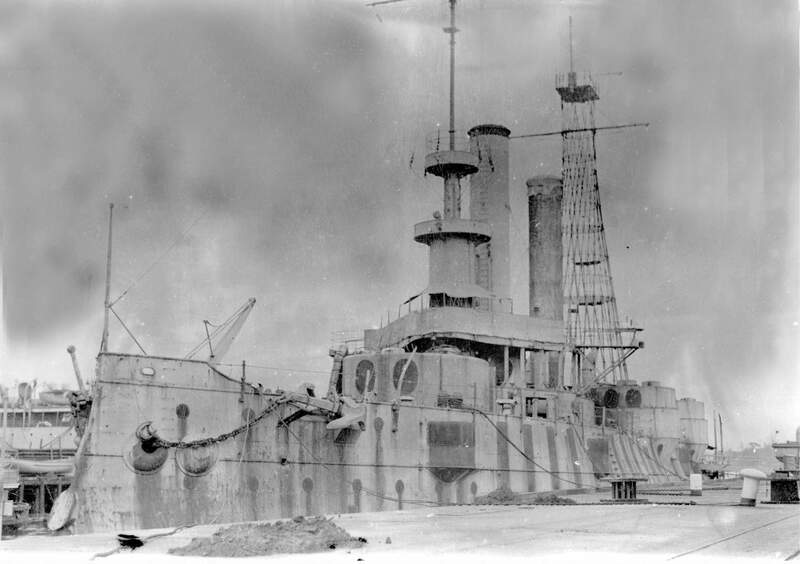 She appears here in a photo dated 26 October 1908 prior to the installation of the cage mainmast. Photo i.d. courtesy of Richard M. Jensen. 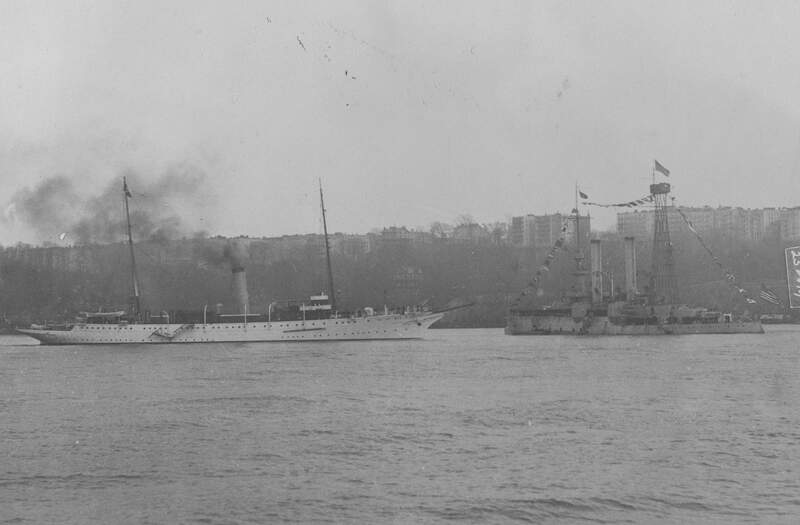 68k Probably photographed in New York Harbor, circa 1911. U.S. Naval Historical Center Photograph # NH 63501. 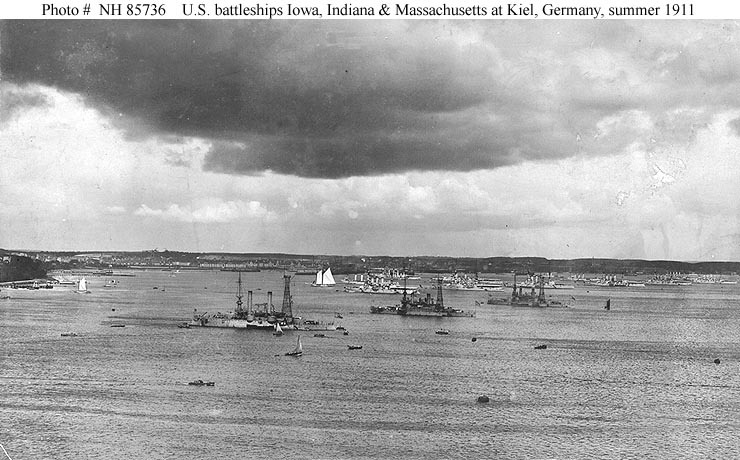 92k Iowa (BB-4) -- front left center -- Indiana (BB-1) and Massachusetts (BB-2) at Kiel, Germany, during the Academy practice cruise, Summer 1911. 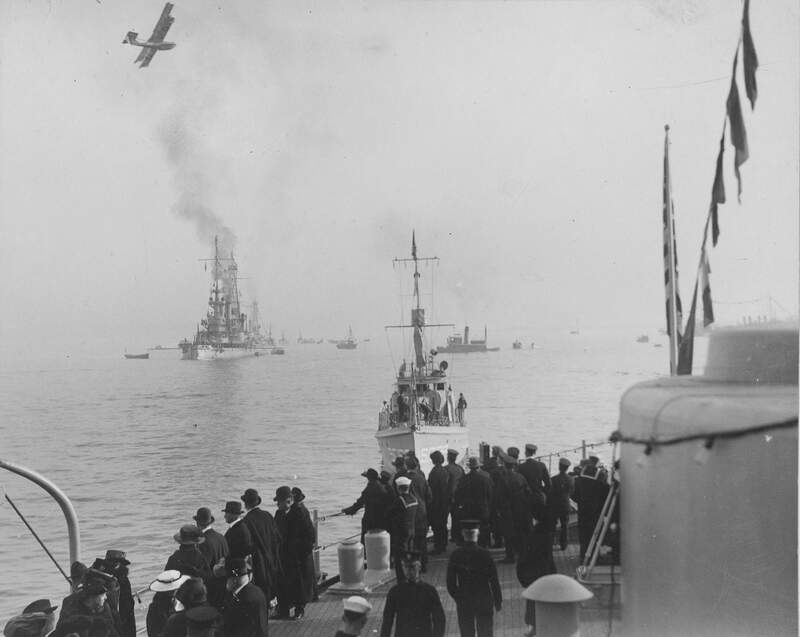 Ships of the German fleet are in the background. U.S. Naval Historical Center Photograph # NH 85736. 110k Photograph, taken circa 1912, reproduced in retouched and color-tinted form on a postal card. U.S. Naval Historical Center Photograph # NH 53262-KN. This ship is also "hull down"and is actually beyond the fifth ship in the photo. Visible are cage main mast (second from the left in the photo), the 2 tall funnels and the military mast partially hidden the shorter funnel of the nearer ship. The funnels identify the ship. 117k In the Reserve Basin at the Philadelphia Navy Yard, Pennsylvania, January 1919. U.S. Naval Historical Center Photograph # NH 53261. 118k In the Reserve Basin at the Philadelphia Navy Yard, Pennsylvania, circa early 1919. She is flying a Rear Admiral's flag from her main mast peak. U.S. 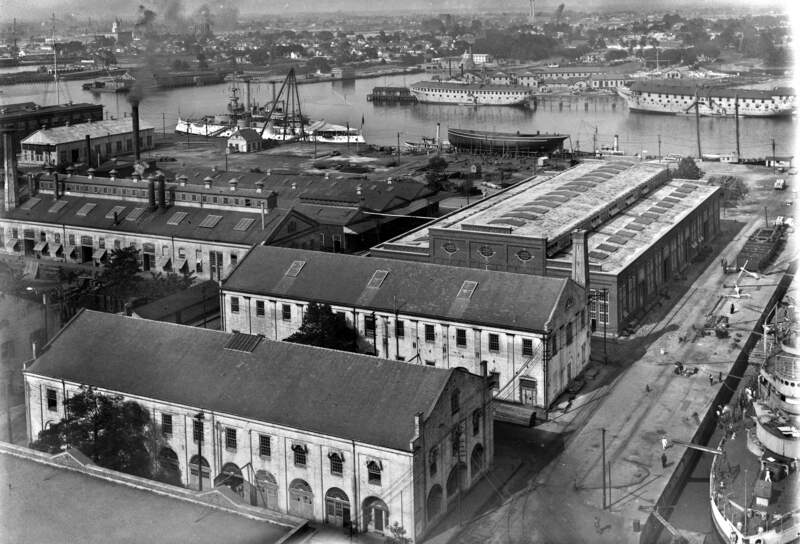 Naval Historical Center Photograph # NH 74096, courtesy of the Naval Historical Foundation, Washington, D.C.
116k Philadelphia Navy Yard, Pennsylvania. 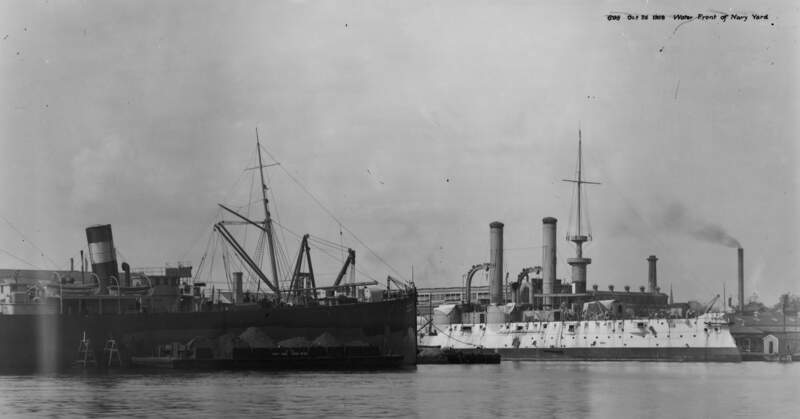 Destroyers and other ships at the Yard in March 1919, awaiting decommissioning. 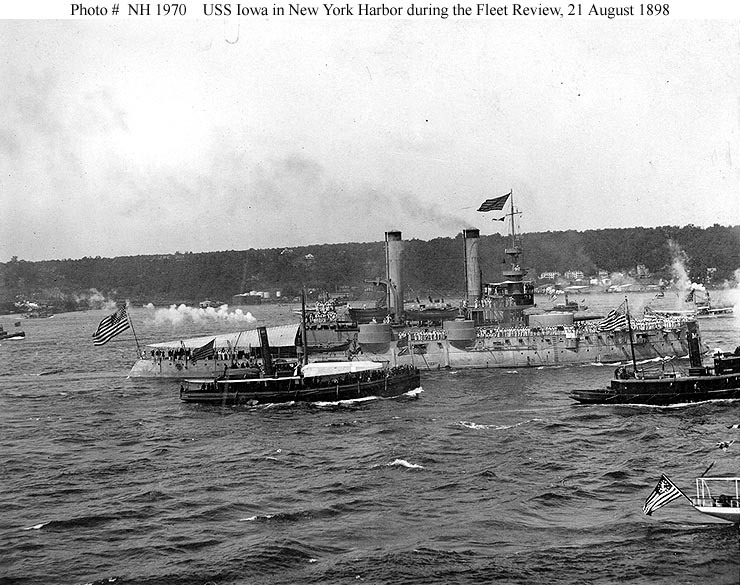 Identifiable ships include: Iowa (BB-4), at far left; Isabel (PY-10), left center; Lawrence (DD-08), foreground; and Perry (DD-11), inboard of Lawrence. Note Lawrence's after torpedo tube and pattern camouflage. U.S. Naval Historical Center Photograph # NH 52104. 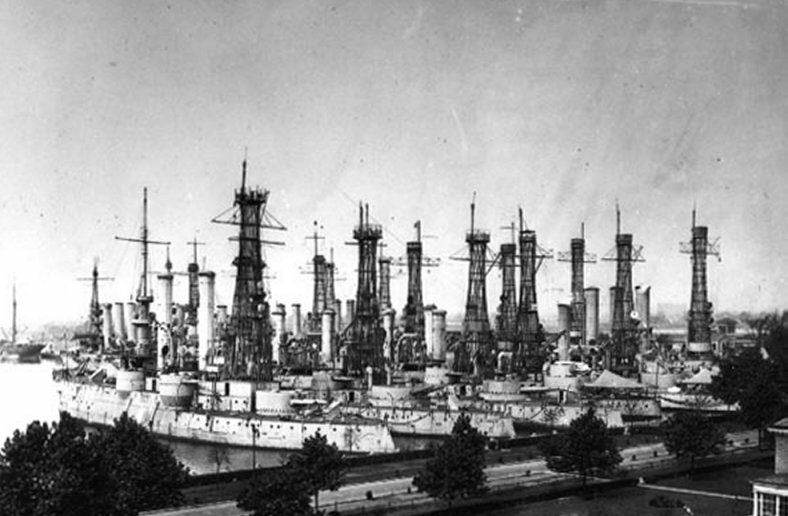 82k Old battleships in the Reserve basin at the Philadelphia Navy Yard, 22 October 1919. Ships in the front row are, from left to right: Iowa (BB-4); Massachusetts (BB-2); Indiana (BB-1); Kearsarge (BB-5); Kentucky (BB-6); and Maine (BB-10). U.S. Naval Historical Center Photograph # NH 92300. 797k WHAT GATHMANN SHELLS DID TO A TARGET SIMULATING THE BATTLESHIP IOWA (BB-4). Image and text provided by The New York Public Library, Astor, Lenox and Tilden Foundation. Photo & text by The Sun. (New York [N.Y.]) 1916-1920, 28 December 1919, Section 7 Magazine Section, Image 71, via chroniclingamerica.loc.gov. 584k The onetime pride of the American Navy and the former flagship of the late Admiral "Fighting Bob" Evans, the Iowa (BB-4), thirty years old, obsolete and soon to be used as a moving target for our modern dreadnoughts. 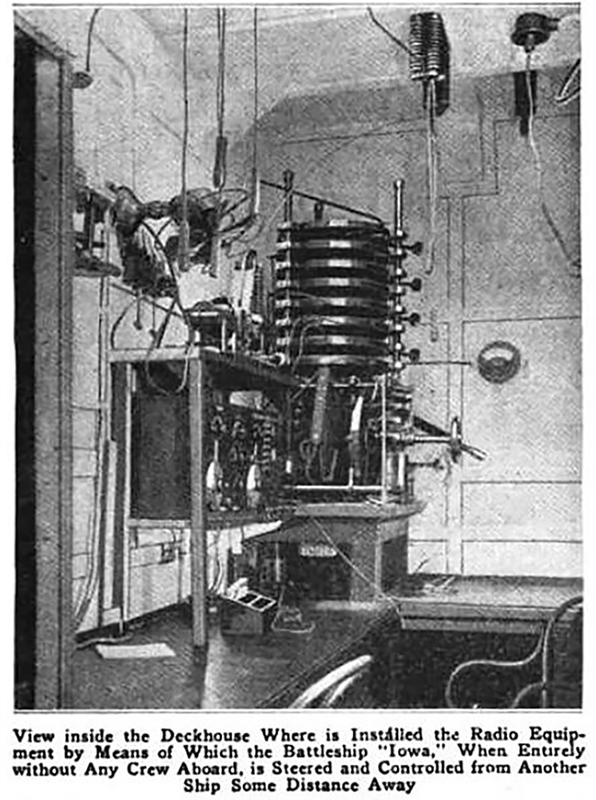 The movements of the old battleship during these experiments will be directed by the powerful wireless apparatus invented by John Hays. Image provided by: Library of Congress, Washington, DC. Photo from New-York Tribune. (New York [N.Y.] 1866-1924, 18 April 1920, Image 61, via chroniclingamerica.loc.gov. 680k On 30 April 1919, Iowa (BB-4) was renamed Coast Battleship No. 4, and was the first radio controlled target ship to be used in a fleet exercise. She appears here sometime between April 1919 & April 1920. Text courtesy of DANFS. 468k General William Mitchell and the 1st Provisional Air Brigade. USN photo # Lot-6095-1 from the album entitled, First Provisional Air Brigade, Langley Field, Hampton, Virginia, 1921. From the William Mitchell Collection. Courtesy of the Library of Congress from the National Museum of the U.S. Navy via flickr.com. 343k 100lb demotion � Martin aircraft, with MK.20 rack and Mk.1 bomb. USN photo # Lot-6095-4 from the album entitled, First Provisional Air Brigade, Langley Field, Hampton, Virginia, 1921. From the William Mitchell Collection. Courtesy of the Library of Congress from the National Museum of the U.S. Navy via flickr.com. 1.83k Direct Hits From the Air While Traveling at Speed of Ninety Miles an Hour Image and text provided by Library of Congress, Washington, DC. 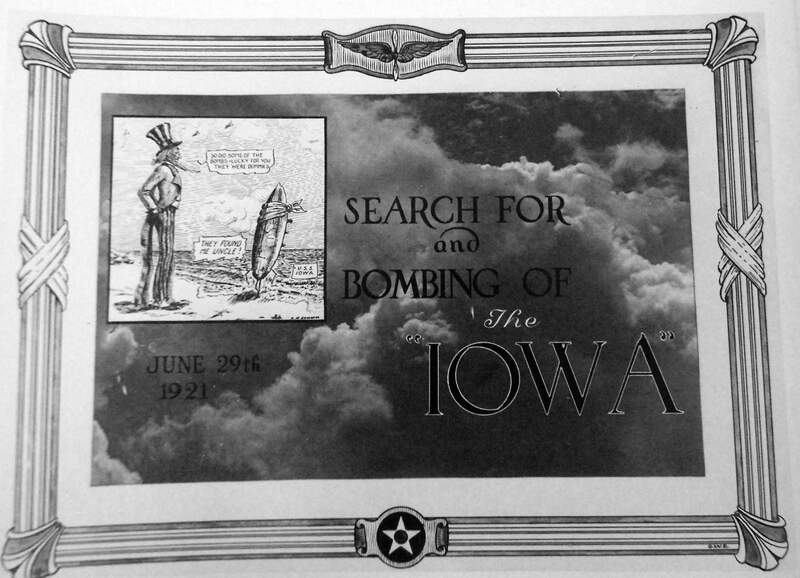 Iowa (BB-4) Will Be Used in Effort to Evade Air Patrols in Army Blimps Image and text provided by Library of Congress, Washington, DC. Photo from New-York Tribune. (New York [N.Y.]) 1866-1924, 05 June 1921, Image 25, via chroniclingamerica.loc.gov. 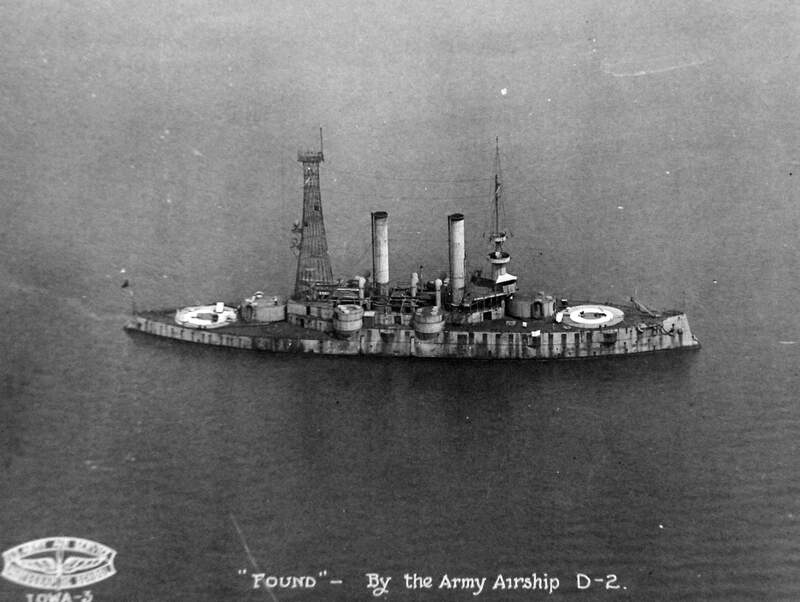 107k Underway following conversion to a radio-controlled target ship, circa June 1921. U.S. Naval Historical Center Photograph # NH 83685, courtesy of the Naval Historical Foundation, Washington, D.C. Collection of Captain John Lansing Callan, USN. 790k Anti-Ship Bombing Demonstration, 1921. 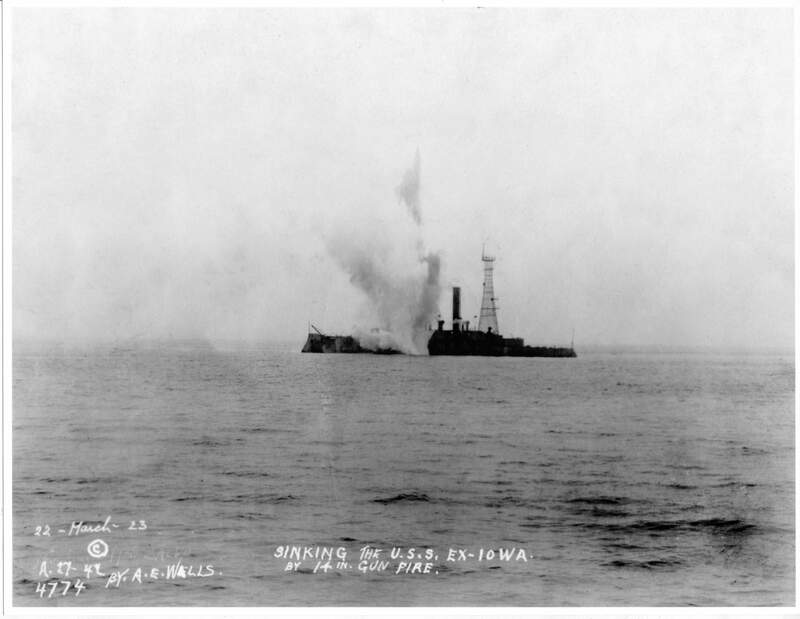 Search for & Bombing of the Iowa (BB-4), 29 June 1921. USN photo # Lot-6095-19 from the album entitled, First Provisional Air Brigade, Langley Field, Hampton, Virginia, 1921. From the William Mitchell Collection. Courtesy of the Library of Congress from the National Museum of the U.S. Navy via flickr.com. 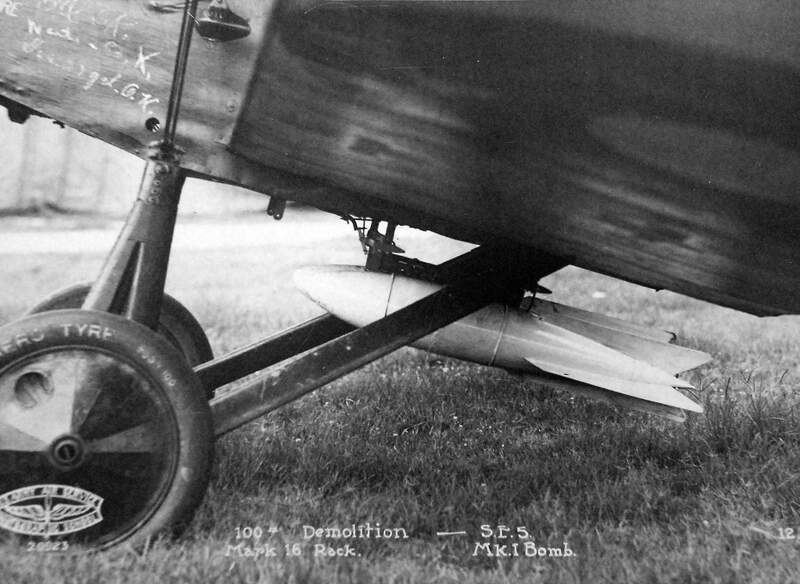 356k 100lb SE5, Mark 16 Rack, MK1 Bomb, 29 June 1921. USN photo # Lot-6095-21 from the album entitled, First Provisional Air Brigade, Langley Field, Hampton, Virginia, 1921. From the William Mitchell Collection. Courtesy of the Library of Congress from the National Museum of the U.S. Navy via flickr.com. 760k Found by the Army Airship D-2, 29 June 1921. USN photo # Lot-6095-21 from the album entitled, First Provisional Air Brigade, Langley Field, Hampton, Virginia, 1921. From the William Mitchell Collection. Courtesy of the Library of Congress from the National Museum of the U.S. Navy via flickr.com. 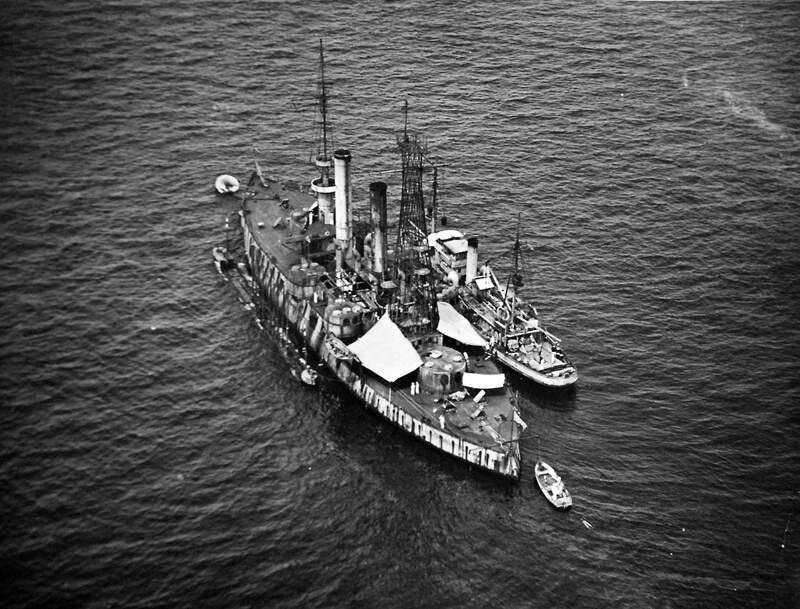 796k A BLIMP LOCATES THE IOWA (BB-4), the old battleship of Spanish War days, which, without a soul on board and controlled by radio from the distant Ohio (BB-12), served as a target for twenty-five planes one day last week some ninety miles northeast of Cape Henry in the most spectacular bombing practice at sea ever held. But two hits were scored by the eighty concrete bombs dropped. Image provided by: Library of Congress, Washington, DC. Photo from New-York Tribune. (New York [N.Y.] 1866-1924, 10 July 1921, Graphic Section, Image 61, via chroniclingamerica.loc.gov. 651k IOWA (BB-4) BACK TO NAVY YARD. 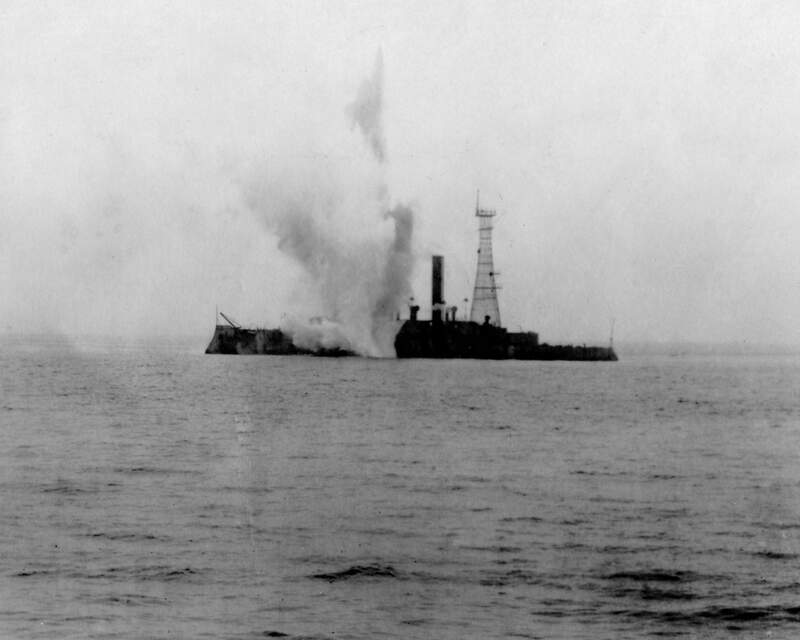 After a few days off Cape Charles Lighthouse, as a target for airmen of the U. S. Navy, the battleship, which was twice hit, is again in the back channel at the Navy Yard. Image and text provided by Penn State University Libraries; University Park, PA.
Photo from Evening Public Ledger. 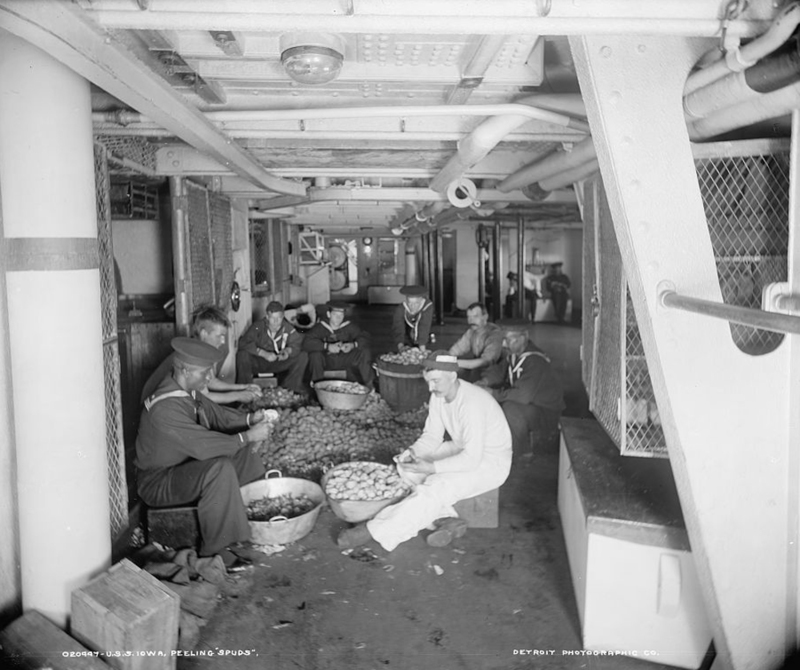 02 July 1921, NIGHT EXTRA, Image 18, via chroniclingamerica.loc.gov. 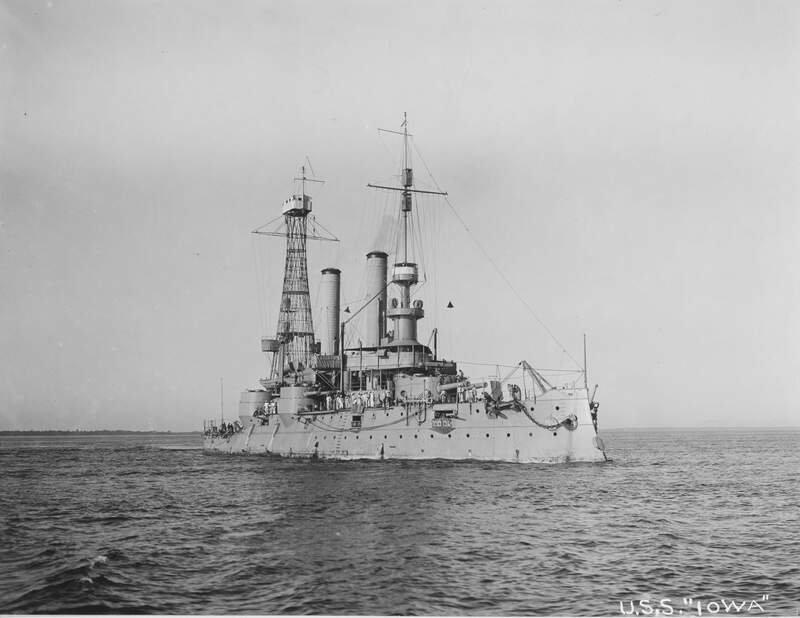 After the navy plane in the recent bombing tests had located the radio controlled battleship Iowa (BB-4) off the Virginia capes, the bombing operations had to be delayed for a time because the three-masted schooner calmly sailed into the field of action. The picture was taken from the air. Image and text provided by Idaho State Historical Society. Photo from The Idaho Recorder. (Salmon City, Idaho) 1886-1927, 29 July 1921, Image 6, via chroniclingamerica.loc.gov. 744k THE BATTLESHIP IOWA (BB-4) will soon be controlled by radio entirely and without a person aboard will be sent out to sea, where she will be destroyed by the guns of the Atlantic Fleet.... Image and text provided by Connecticut State Library, Hartford, CT.
Photo & text by The Bridgeport Times and Evening Farmer. (Bridgeport, Conn.) 1918-1924, 20 April 1922, Magazine, Image 13, via chroniclingamerica.loc.gov. 1.08k U.S. Navy Yard, Norfolk, Va., Dry docks 3, 4, 6 & 7. 63k Quail (AM-15), alongside the radio-controlled target ship Coast Battleship No. 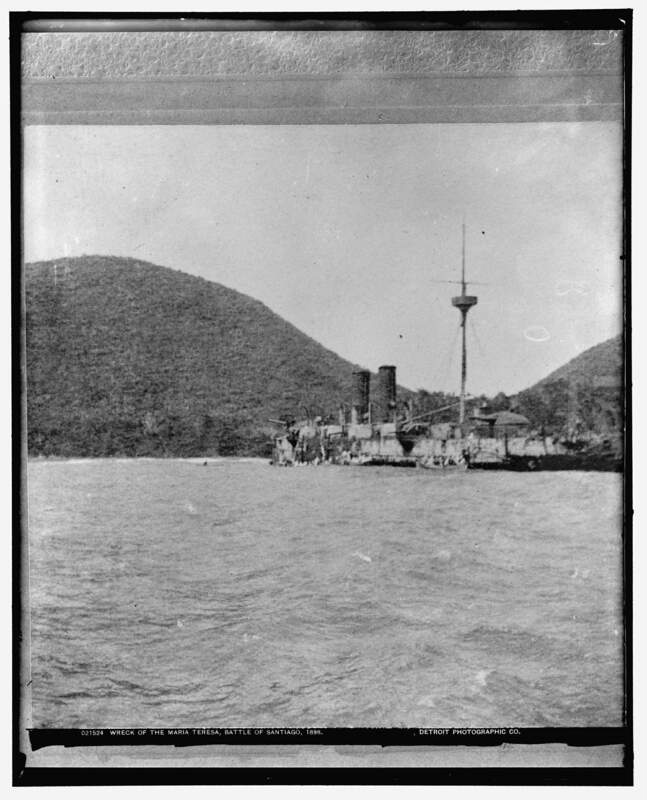 4 ex-Iowa (BB-4), probably in Panama waters, circa February-March 1923. Quail provided salvage support during exercises with the target ship. U.S. Naval Historical Center Photograph USNHC # 77309. 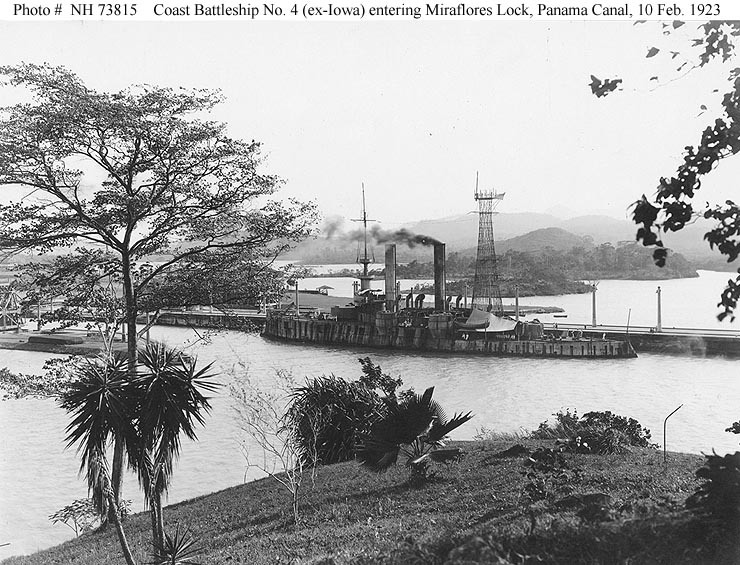 142k Entering Miraflores Lock, Panama Canal, on 10 February 1923. She was in the Panama area to serve as a radio-controlled target during Fleet gunnery exercises. U.S. 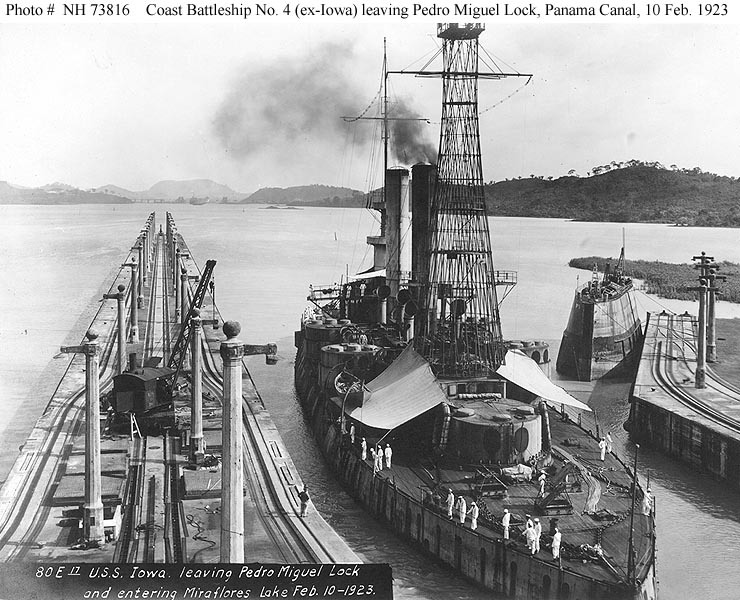 Naval Historical Center Photograph # NH 73815, courtesy of the Naval Historical Foundation, Washington, D.C.
91k In the Pedro Miguel Lock, while transiting the Panama Canal on 10 February 1923. Contocook (AT-36) is in the lock behind her, and SS Bethore is at right. Coast Battleship No. 4 ex-Iowa (BB-4) was then in the Panama area to serve as a radio-controlled target ship for Fleet gunnery exercises. U.S. Naval Historical Center Photograph # NH 83700, courtesy of the Naval Historical Foundation, Washington, D.C.
126k Leaving the Pedro Miguel Lock and entering Miraflores Lake, while transiting the Panama Canal, 10 February 1923. She was in the Panama area to serve as a radio-controlled target during Fleet gunnery exercises. 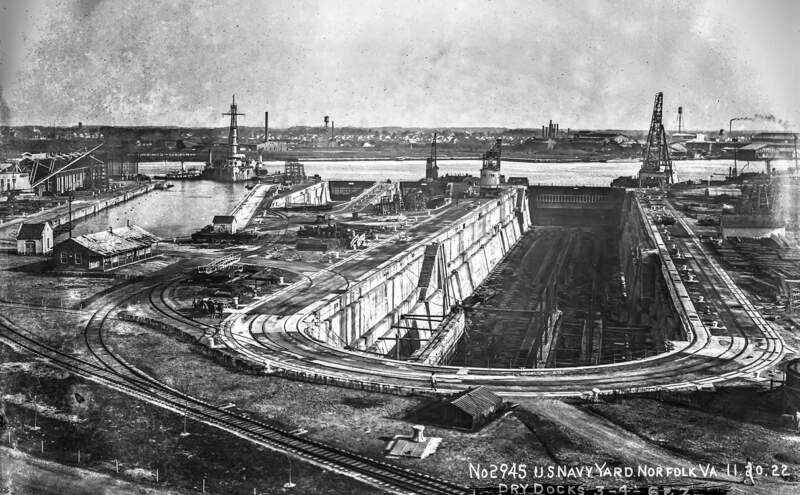 Note the lock caisson at right. U.S. 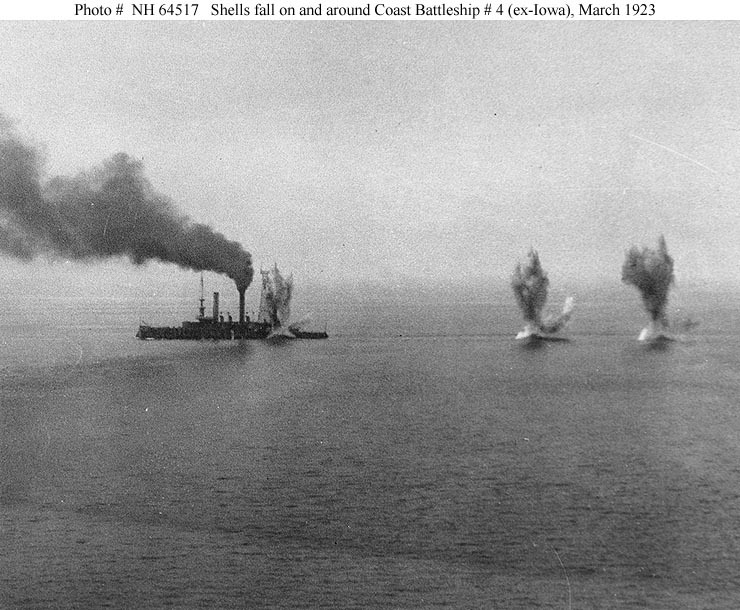 Naval Historical Center Photograph # 73816, courtesy of the Naval Historical Foundation, Washington, D.C.
1.31k Iowa (BB-4) under fire from Mississippi (BB-41) in the Gulf of Panama, 21 March 1923. This experimental firing was a big press event which had Iowa bombarded by 5" batters from 8,000 yards away, hit by 30 14" shells from a greater distance, and then finally sunk by heavy projectiles of 14" inch shells. 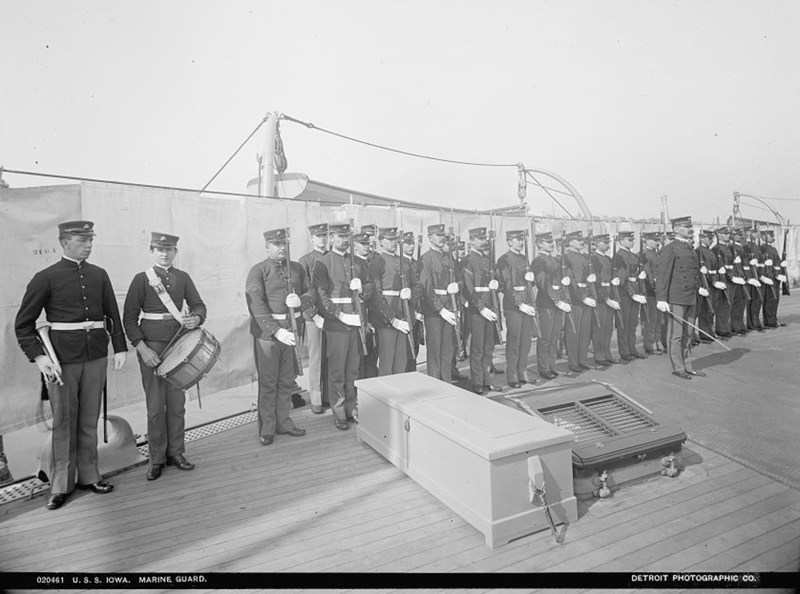 Photo # NMUSN-P-D-2015-1-21 from the collection of Fleet Admiral William D. Leahy, Jr., Courtesy of the Library of Congress from the National Museum of the U.S. Navy via flickr.com. 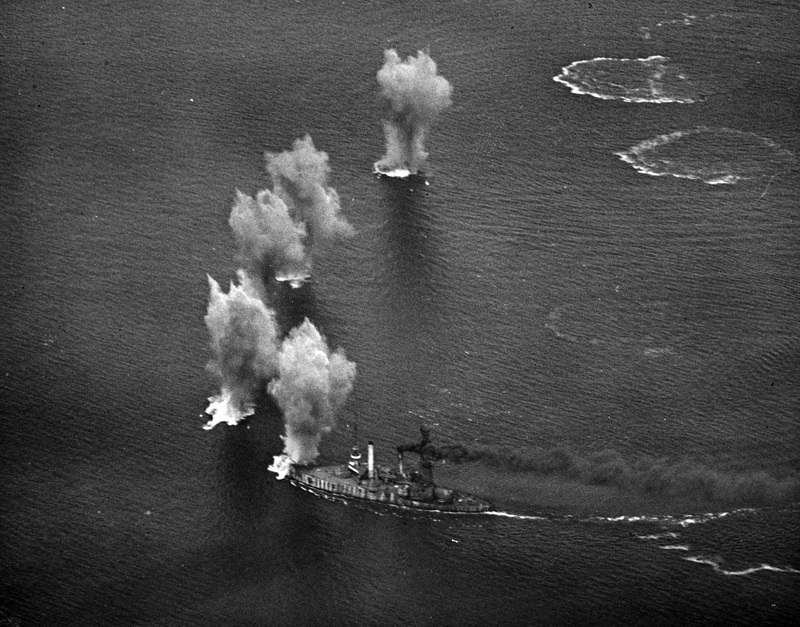 455k Two views showing the Iowa (BB-4) being shelled & sunk by 14 inch guns. Photo from pacificbattleship.com courtesy of Dave Way, Curator, Battleship Iowa BB 61, Pacific Battleship Center. 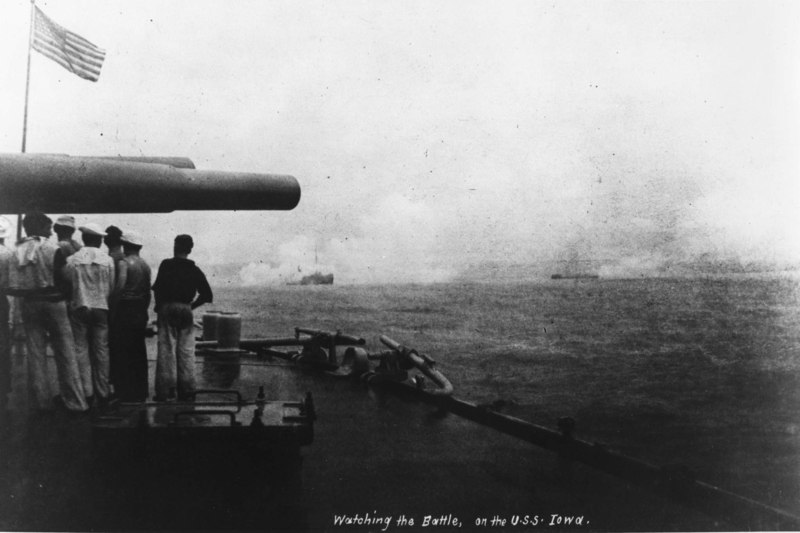 112k Under fire by the main battery of Mississippi (BB-41), while in use as a radio-controlled target during Fleet gunnery practice off Panama, 22 March 1923. Note 14" inch projectile hitting very close to the target, as others impact further away. 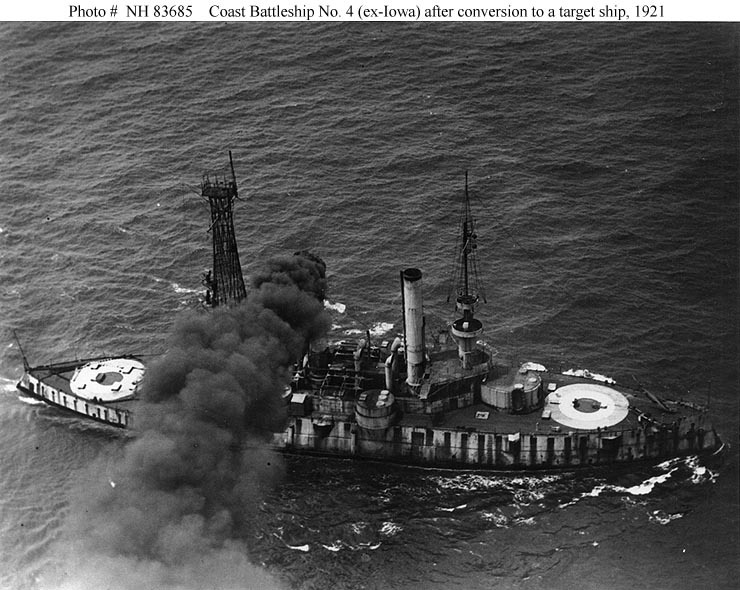 The target ship was sunk as a result of damage received in this exercise. U.S. Naval Historical Center Photograph # NH 64517. 95k Coast Battleship No. 4 ex-Iowa (BB-4) under fire by battleship guns, while in use as a radio-controlled target during Fleet gunnery practice off Panama, 22 March 1923. 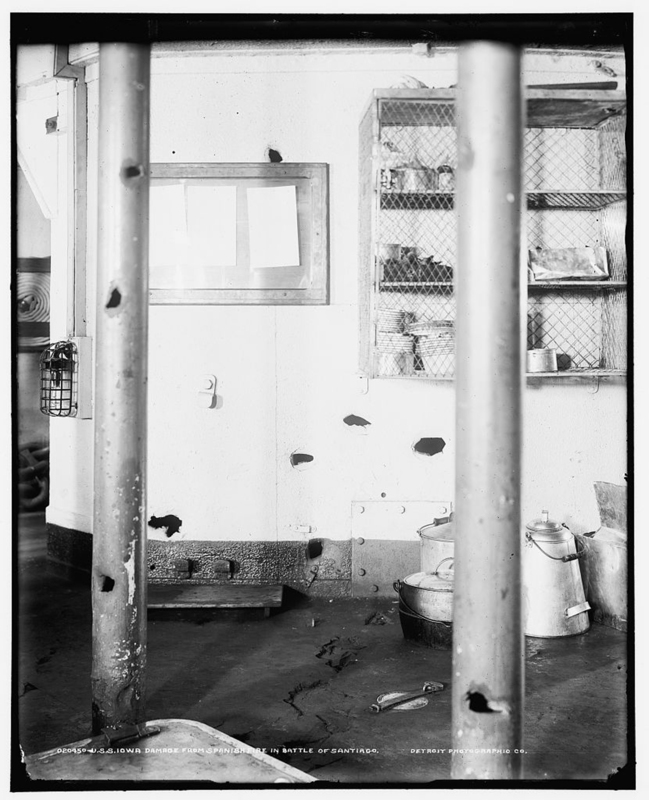 Note projectiles hitting the water on either side of the target, and the ship's collapsed forward smokestack. Photographed by A.E. Wells. 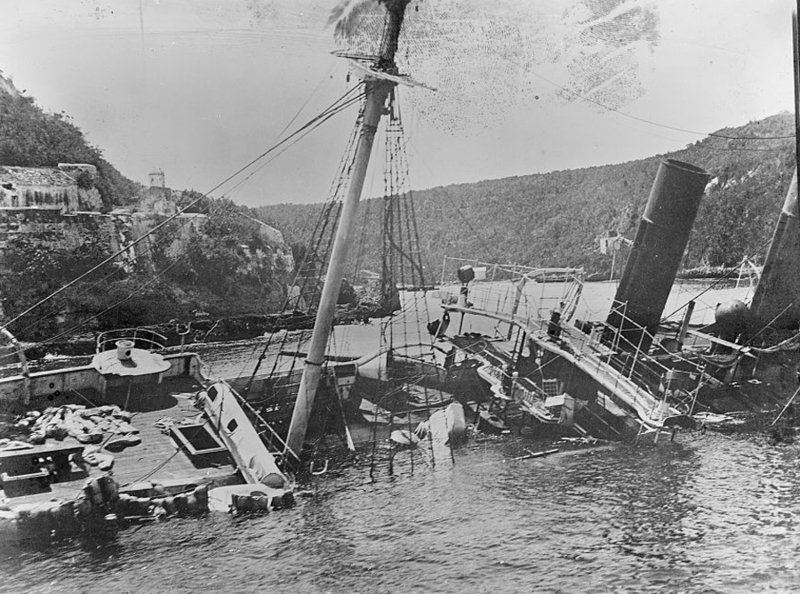 The ship was sunk as a result of damage received in this exercise. U.S. Naval Historical Center Photograph # NH 96027. 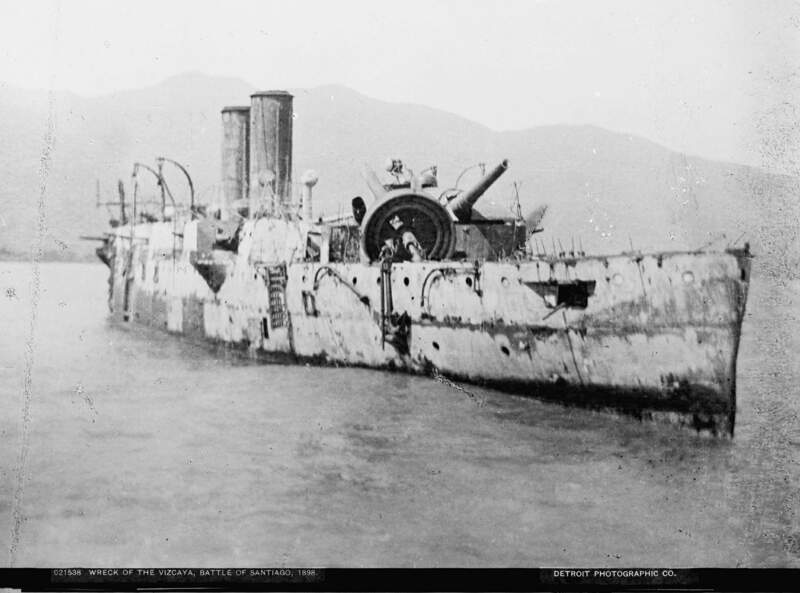 108k Damaged after use as a radio-controlled target during Fleet gunnery practice off Panama, 22 March 1923. 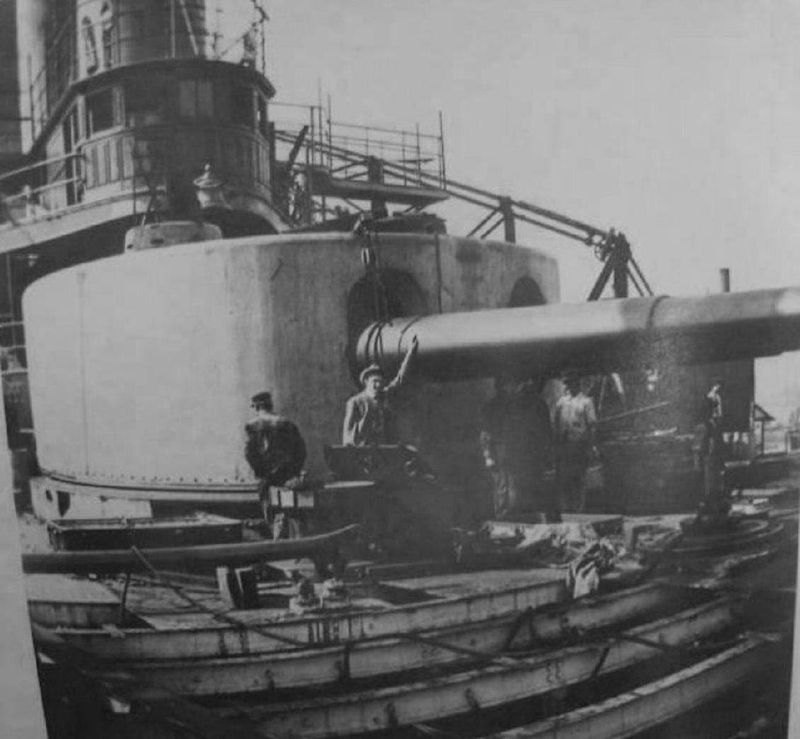 Note shell holes in the ship's hull side, in line with the main mast, collapsed forward smokestack, and other damage to her superstructure. Also note numbers painted around her lower fore-top, probably to indicate bearings, and F5L flying boat taxiing in the left background. The target ship was sunk as a result of damage received in this exercise. U.S. Naval Historical Center Photograph # NH 64518. 796k ex-Iowa (BB-4), at anchor in Panama Bay, later sunk by gunfire while maneuvering under radio control, 23 March 1923. USN photo # Lot-11952-VI-38 Ernest La Rue Collection, Gift of the U.S. Army. Courtesy of the Library of Congress from the National Museum of the U.S. Navy via flickr.com. 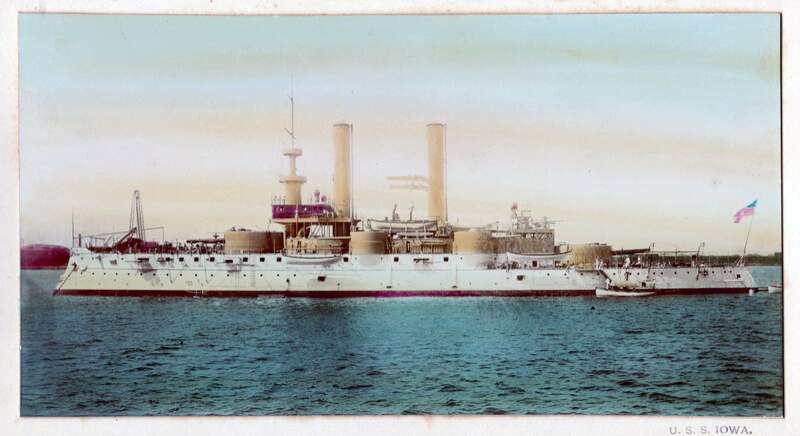 49k Postcard photo of the Coast Battleship No. 4 ex-Iowa (BB-4). 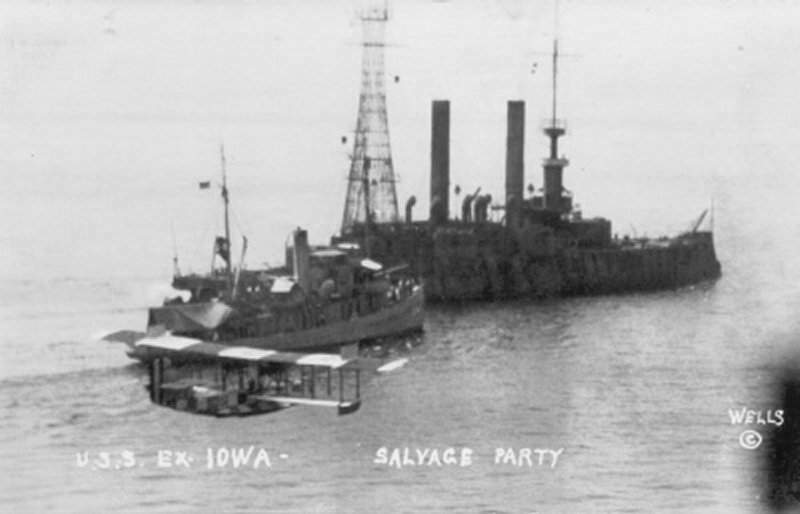 The photo shows the salvage party and F5L flying boat taxiing to the Iowa when it was used as a target ship for the Mississippi (BB-41). USN photo by A.E. Wells.